"Liszt gained renown in Europe during the early nineteenth century for his virtuosic skill as a pianist. He was said by his contemporaries to have been the most technically advanced pianist of his age, and in the 1840s he was considered to be the greatest pianist of all time. Liszt was also a well-known and influential composer, piano teacher and conductor. He was a benefactor to other composers, including Richard Wagner, Hector Berlioz, Camille Saint-Saëns, Edvard Grieg and Alexander Borodin. As a composer, Liszt was one of the most prominent representatives of the ""New German School"". He left behind an extensive and diverse body of work in which he influenced his forward-looking contemporaries and anticipated some 20th-century ideas and trends." Austro-Hungarian composer (1811-1886). Autograph Letter Signed. Pest. 8vo. 3 pages. 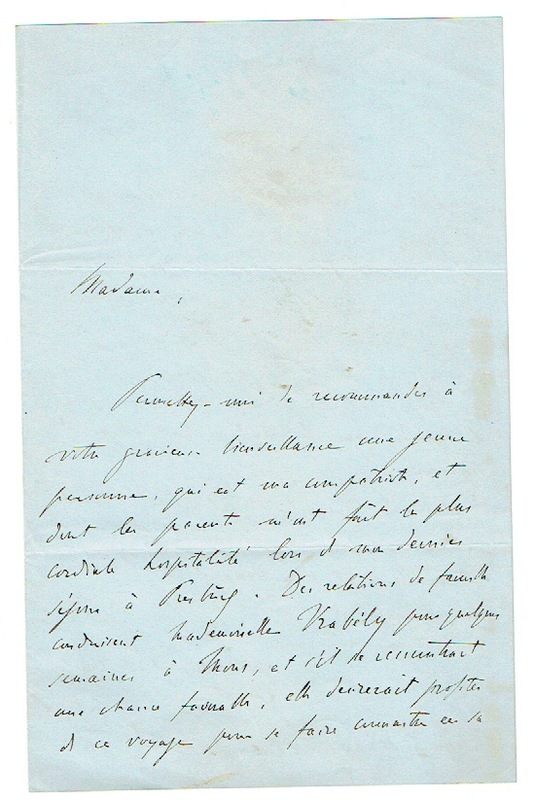 To „Madame Princess“ in French, thanking her for constant kindnesses, asking forgiveness for having failed to give her letter of recommendation to Mr. De Sournerand, and asking whether she would accept the enclosed book by Mr. Nohl [not present], who has written favorable reviews of Debussy's works in the Allgemeine Zeitung. 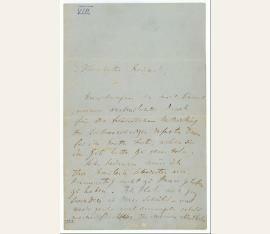 "Your very gracious lines did not reach me until the moment of my departure from Vienna. […] [L]ast Tuesday has added yet another date to those [kindnesses] for which I am very sincerely grateful. "Will you forgive me an unintentional fault of omission […] ? I only had a couple of hours to spend at the exhibition. Mr. De Sournerand was not there after all, and I had to leave for Pest without giving him your letter of recommendation. 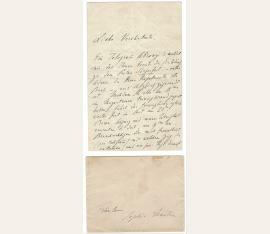 „[…] I […] send you […] the votive offering of Mr. Nohl, to whom I owe thanks for the kind opinion he recently gave in the Allgemeine Zeitung of my Messe de Grau and my Oratorio du Christ. Nohl will be coming here to listen to this work again at the festival on 9 November, and I want to be as helpful to him as possible. 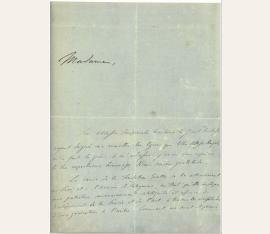 Thus I beg to ask your Highness to […] accept the dedication of his new volume which it is his ambition to offer to you. […]“. composer and pianist (1811-1866). Autograph Letter Signed. Weimar. 8vo. 2 pages. With orgininal envelope. 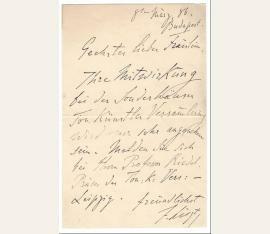 To the music publisher Karl Haslinger of Vienna. 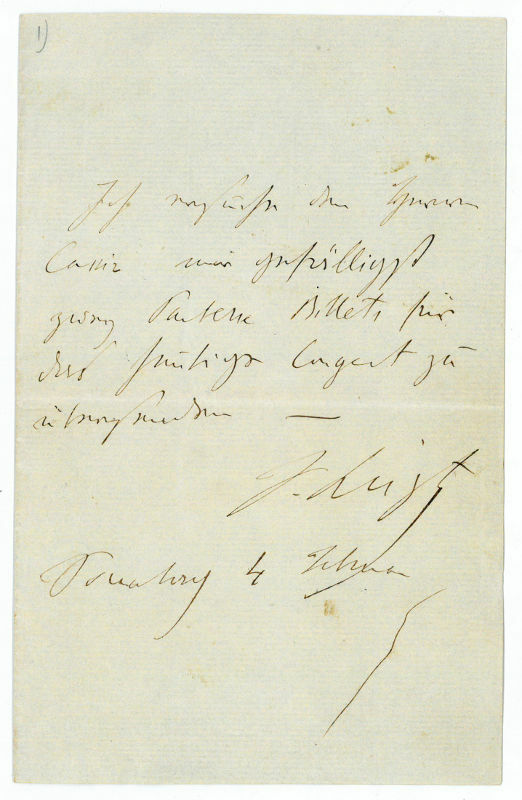 Liszt responds to a request for feedback on his composition, which Liszt is unable to give because he never received a copy of the score: „On returning yesterday from the Magdeburg Music Festival, I found your friendly letter of June 12, for which I express my most obliging thanks right away: however, I must regret not to be able to give you any information on the spatial fate of your so excellent and laudable score, as I have not received it and in consequence I also did not receive the letter which was enclosed in the package. 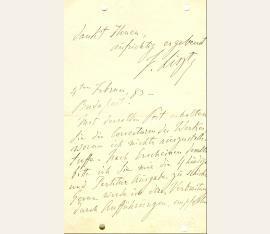 I am expecting corrections from Herr Spina soon, and probably he intends to send the score along – but in case there is further delay with the corrections, you would be me a big favor if you would ask Herr Spina to send me the oratorio by mail first. Permit, highly esteemed Sir, the expression of my utmost esteem“ (transl. from the German original). 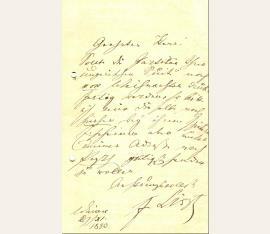 - Carl Anton Spina was another Austrian music publisher; he took over the firm of Diabelli when he retired in 1851. Spina printed works by Johann and Josef Strauss..
Komponist und Pianist (1811-1886). Autographed letter signed. o. O. u. D. 8vo. 2 1/2 SS. Leichte Bräunung. Eckausriss ohne Textverlust. 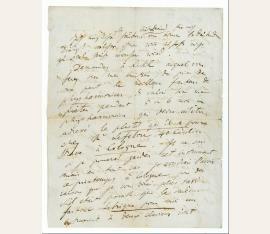 To the editor Heinrich Brockhaus, pointing out some mistakes in the article concerning Liszt himself. Komponist und Pianist (1811-1886). Autographed letter signed. o. O. u. D. 4to. 1 S. Leichte Bräunung. Eckausriss ohne Textverlust. Komponist und Pianist (1811-1886). Autographed letter signed. o. O. 8vo. 1 S.
Komponist und Pianist (1811-1886). Autographed letter signed. Sexard. 8vo. 2 pp. Komponist und Pianist (1811-1886). Autographed letter signed. o. O. u. D. 32mo. 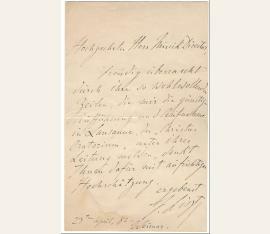 1 p.
Komponist und Pianist (1811-1886). Kabinettphotographie mit eigenh. Widmung und Unterschrift. 220 : 135 mm. Hübesches Brustbild im Profil nach rechts. 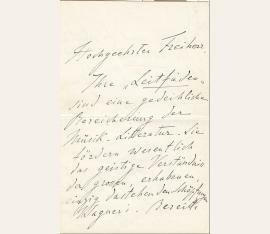 Die Widmung an die berühmte Sopranistin Luise Reuss-Belce (1862-1945): „Fr(äu)l(ein) Belce freundlichst […]“. Photographie: Kuntzenmüller, Baden-Baden. Reuss-Belce verkörperte in der Uraufführung von Wagners „Parsifal“ bei den Bayreuther Festspielen 1882 eines der Blumenmädchen. Das Foto entstand während Liszts Aufenthalt in Baden-Baden vom 17. bis zum 24. Mai 1880. Fehlstelle rechte untere Ecke außerhalb des Schriftzugs. 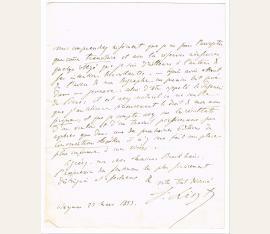 Letter Signed ("F. Liszt"). n. p. 1 p. Folio. Bifolium. 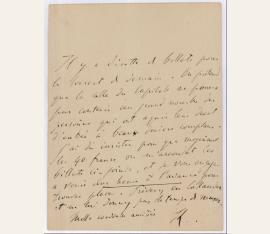 To "Monsieur le Comte,". 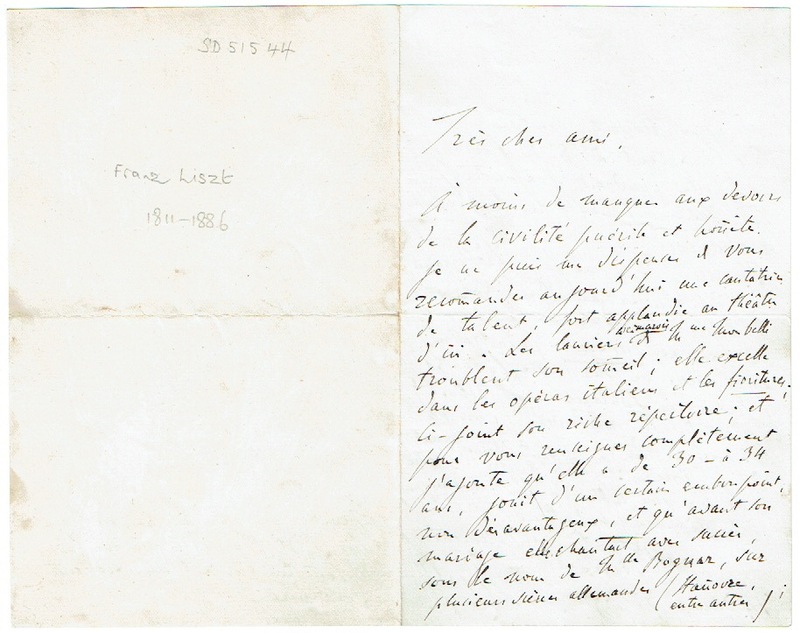 Lizst offers his gratitude for the diploma given to him by the Société de bienfaisance et de secours, regrets that his busy schedule prevents him from paying a visit in person, and informs the recipient that he will send his secretary over to deliver his subscription. 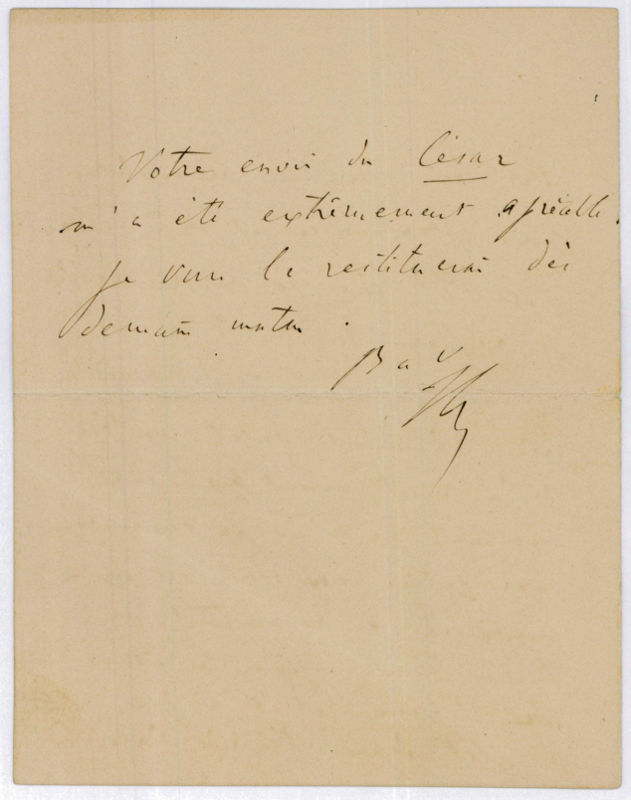 A dealer's note penciled to the back of the letter reads, "Envelope 'a Monsieur M le Comte Ange de Brignola,'" above the date 17 Avril 1844 (excised from the envelope?) and mounted. Komponist und Pianist (1811-1886). Autograph letter signed. Weimar. 8vo. 2 pp. Mit eigenh. Briefkuvert. 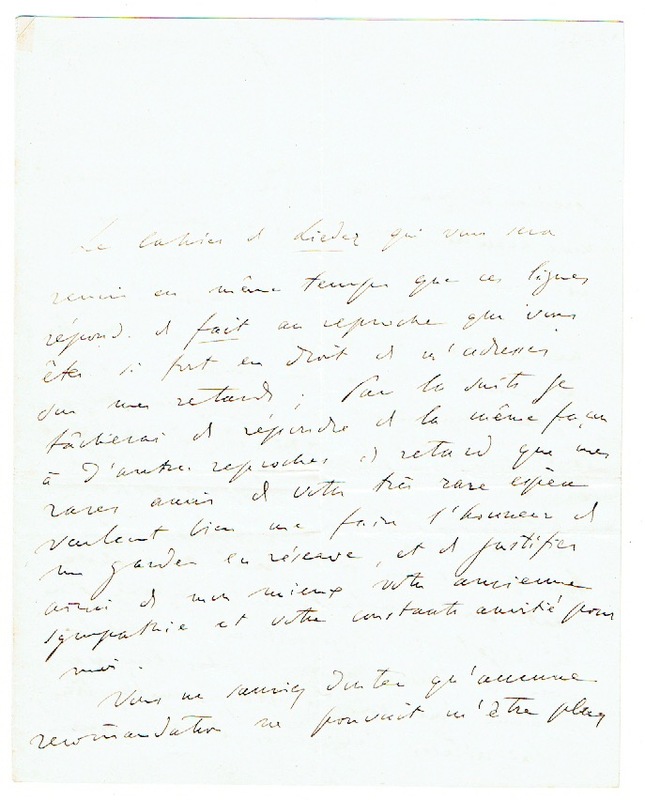 To Madame Price, sending a recommendation: „[…] à son âge on ne tient pas grand compte des ronces et des pierres qui encombrent la carrière que les artistes sont obligés de parcourir! […]“. Komponist u. Pianist (1811-1886). Autograph letter signed. Eilsen. 8vo. 2 pp. 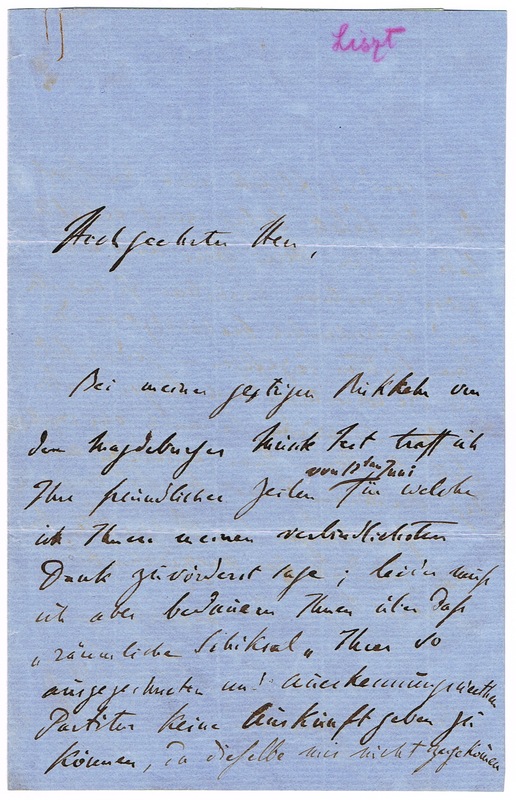 To Madame A[nna] Kuhlmann in Hildesheim, whose letter has affected him deeply, but nevertheless he has to refuse every offer to participate in a public event. In case that she is telling him the day of Wachsmuth’s performance, he will offer a small contribution. 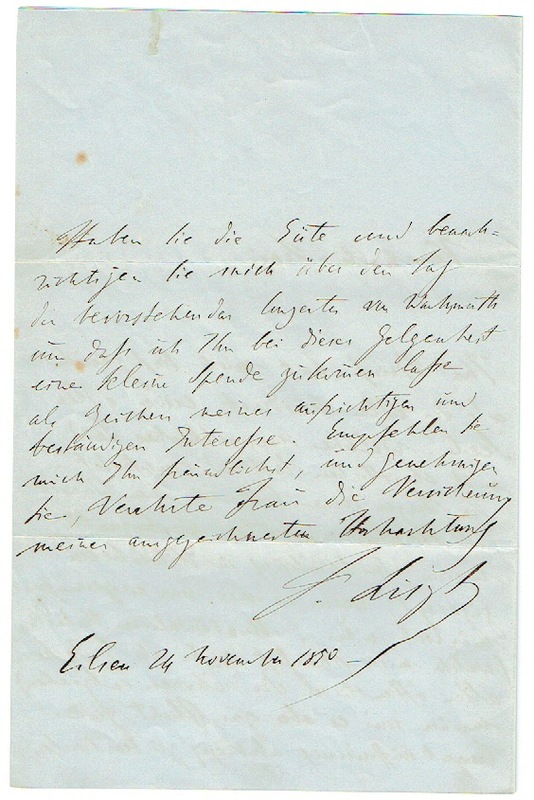 Komponist und Klaviervirtuose (1811-1886). 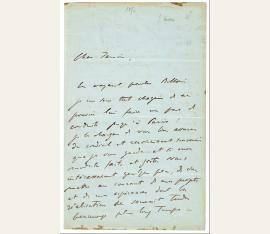 Autograph letter signed („F. Liszt“). 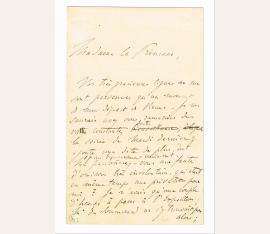 [Paris], rue neuve des Mathurins, [Nov. 1836]. 8vo. 2 pp. 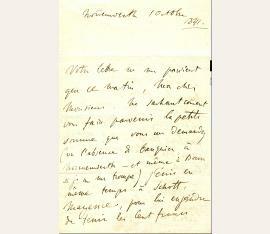 To Monsieur Daponchel about a concert: „C'est encore moi, qui viens vous impatiencer Monsieur; mais le Concert ayant été annoncé pour Dimanche prochain, l'avis unanime de mes amis est qu'il voudrait infiniment mieux le fixer definitivement pour ce jour là. J'ai de mon coté plusieurs raisons qui me feraient préférer de beaucoup cet arrangement. Si donc il n'y a pas nécessité absolue (et j'ai toute lieu de croire que Mlle Bertin me céderait assez volontiers son tour) que la Esmeralda soit joué Dimanche prochain, je vous saurais un gré extrème de vouloir bien disposer de ce jour en ma faveur […]“. - On November 14 1836, Louise Bertin’s opera La Esmeralda premiered at the Théâtre de l'Académie Royale de Musique in Paris; its libretto was written by Victor Hugo, who had adapted it from his novel Notre-Dame de Paris (The Hunchback of Notre Dame). - Such early specimens are very rare..
Komponist und Klaviervirtuose (1811-1886). Autograph letter signed. Weimar. 4to. 3 pp. Mit Kuvert. 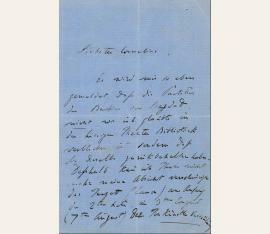 Comprehensive letter to the Dutch-French Romantic painter Ary Scheffer (1795-1858), sending a songbook and promising to continue his efforts to help realising a concert project in Weimar, which is quite difficult in view of the political turbulences the German revolutions of 1848/49 are causing. Austro-Hungarian composer (1811-1886). 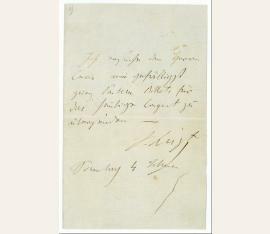 Autograph Letter Signed, "F. Liszt," to Carl Gille ("Dear Friend"), in German. Rome. 3 1/2 pages, 8vo. Praising Carl Riedel's arrangement of Heinrich Schütz's Passions as well as other works performed by the Leipzig Congress of Musicians, suggesting that the Passions as well as the Psalm by [Heinrich] Schulz-Beuthen be published by the Music Society and performed at the Music Festival in 1870, intending to realize a proposal by [Julius?] 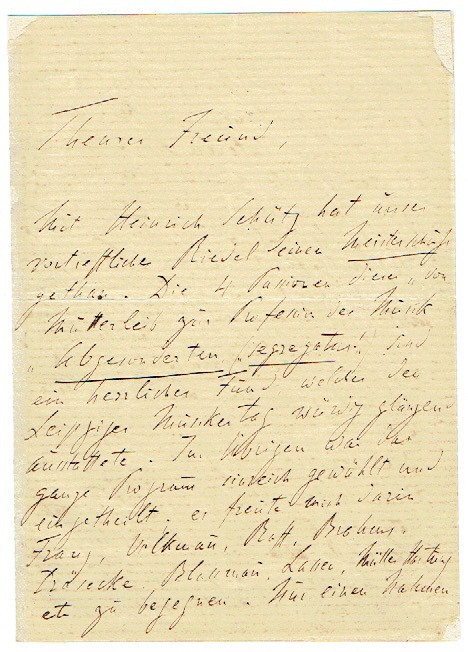 Alsleben in time for the Beethoven Festival in Weimar, requesting that he write to [author of text for Liszt's 2nd Beethoven cantata, Adolf] Stern, noting that he would like to work on the cantata unimpeded, expressing uncertainty about the date of the Rheingold performance, and in a postscript, requesting his address. Complete separations at folds, small closed tear repaired on terminal page with tissue, edges reinforced with tissue, remnants of prior mounting at upper edge of terminal page, some chipping at upper corners of first leaf, even toning overall. "With Heinrich Schütz, our excellent Riedel has made a master shot. The 4 Passions of this 'From womb to the profession of music, separated ("segregatus!")' are a splendid find and served the Leipzig Congress of Musicians worthily and brilliantly. As for the rest, the entire program was selected and arranged ingeniously; I was pleased to see Franz, Volkmann, Raff, Brahms, Draesecke, Blassmann, Lassen, Mueller, Hartung etc. in it. Only one name do I miss: Schulz-Beuthen, whose compositions are of special importance and interest. In my opinion, Schulz's Psalm should be designated as our Music Society's next publication--and be performed at the Music Festival ('70). It would also be fitting to publish the Schütz Passions along with the other three other works of his performed in St. Thomas Church, as publications of the A.D. Musikv[erein]. Communicate this to our Leipzig colleagues. "I intend to work zealously to bring Dr. Alsleben's proposal 'the Musical Art [. . .]' to fruition and likewise to obtain the funding to ensure that the Society's energy remains strong. Hopefully we will attain both results next year on the occasion of the Beethoven Festival in Weimar. "The Stern Beethoven cantata is still not visible on the Roman horizon. I have no lack of things to do, mind you; but I would just like to prepare this work unimpeded for the time being. Do me a favor and write a few pressing lines to Stern. "I have received no definite word about the Rheingold performance. If it takes place on the 25th of August as announced, I will travel from here to Munich on the 18th, where I hope to see you . . . ." Published in Adolf Stern's Franz Liszts Briefe an Carl Gille. No. 25. Leipzig, 1903. Liszt's Beethoven Cantata No. 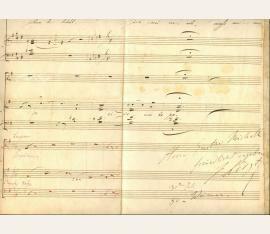 2 was composed to celebrate the centenary of Beethoven's birth. 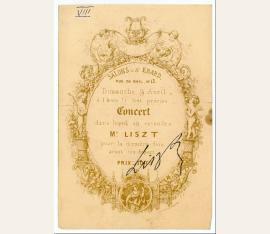 Although the work premiered in May of 1870, Liszt himself conducted the performance in Pest in December of that year..
composer and pianist (1811-1886). Autograph letter signed. Weimar. 8vo. 2 pp. 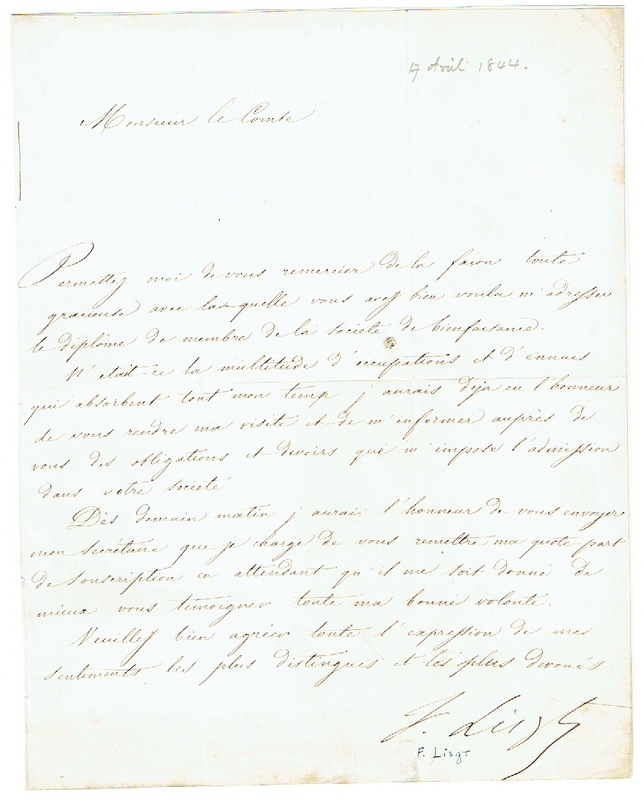 Liszt lui confie ses futurs projets à Paris en recommandant son secrétaire Belloni pour lequel il se sent tout chagrin de ne pouvoir lui faire un pas de conduite jusqu’à Paris. Je le charge de vous bien assurer du cordial et reconnaissant souvenir que je vous garde (…) de vous mettre au courant de mes projets et de mes espérances dont la réalisation ne saurait tarder beaucoup plus longtemps. Il adresse ses hommages à Madame Janin ; il vient d’apprendre que la partition du Petit souvenir Weymarois qu’il lui avait dédiée, lui a été retournée par les prohibitions de la douane française (…). composer and pianist (1811-1886). Autograph letter signed. Pest. 8vo. 2 1/4 pp. 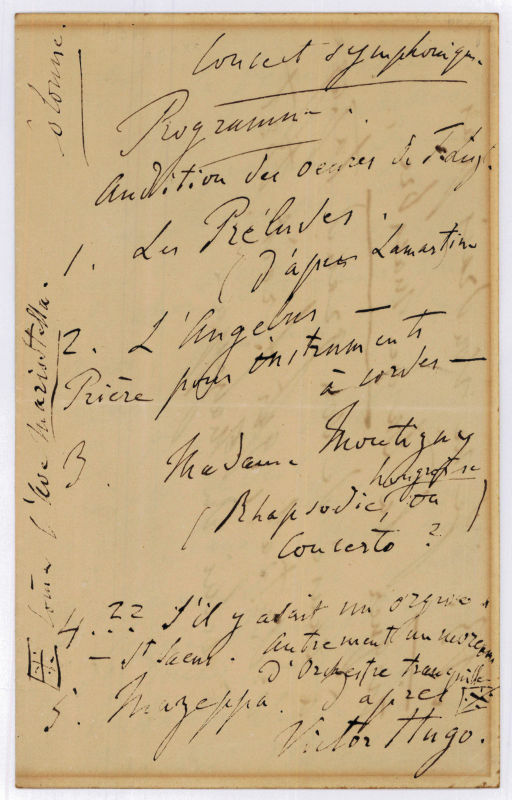 Liszt recommande Mme BALAZS, une cantatrice de talent, fort applaudie au théâtre d’ici. Les lauriers weimarois de Mme Mombelli troublent son sommeil ; elle excelle dans les opéras italiens et les fioritures. (…) J’ajoute qu’elle a de 30 à 34 ans, jouit d’un certain embonpoint, non désavantageux, et qu’avant son mariage elle chantait avec succès sous le nom de Mlle Boguar, sur plusieurs scènes allemandes (Hanovre entre autres) ; ses appointements au théâtre de Pest montent à 8 000 florins ; mais elle voudrait y ajouter (pour ses feux intimes) les lauriers weimarois (…). Il demande donc à son correspondant d’intervenir auprès du baron Loën [intendant du théâtre de Weimar] en faveur de Madame Balazs ; Peut-être lui accorderait-on aussi l’honneur de chanter à un concert de la cour…. Komponist und Pianist (1811-1886). 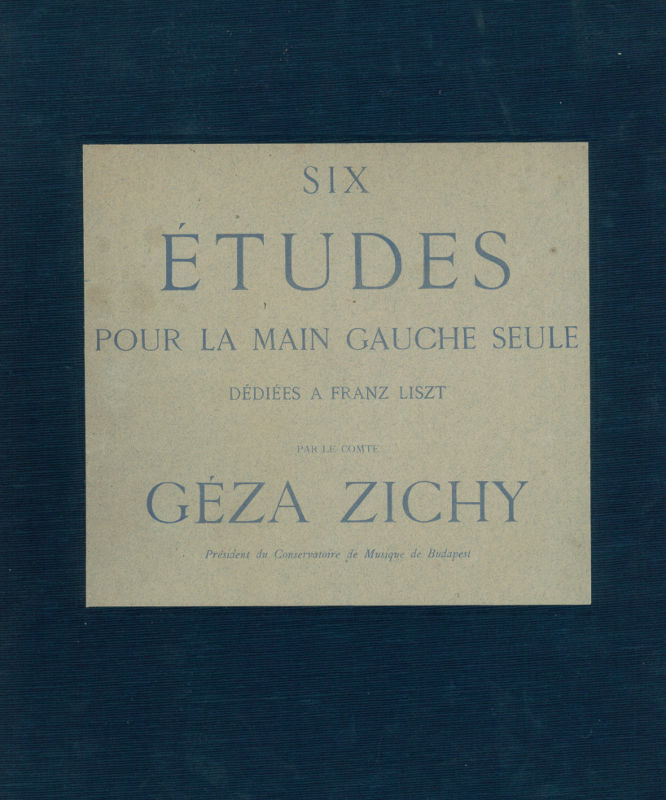 Dedication copy of "Six Etudes pour la main gauche seule". O. O. u. D. 41 SS. Folio. Zeitgenöss. Pappband in moderner Leinenkassette. "A Mlle Vera Timanoff de la part de l'auteur | F. Liszt". - The Russian pianist had been a former pupil of Liszt in Budapest and became a prominent performer in Russia, France, Austria, Britain, Germany and Turkey. - Edges strongly frayed and somewhat dusty. 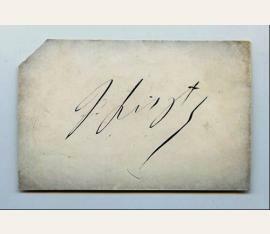 Komponist und Pianist (1811-1886)]. Original photograph. [Weimar. 100:149 mm auf etwas größerem Untersatzkarton. 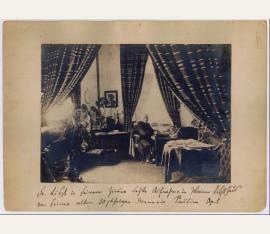 The picture by Louis Held, Weimar, shows Liszt in the study of his house at Weimar. Signed on the reverse by his housekeeper. - Somewhat spotty and silverish. Komponist und Pianist (1811-1886). 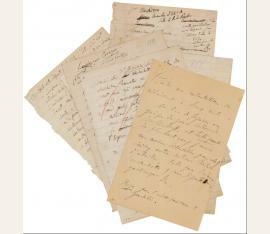 14 autograph letter fragments, written in English and German, partly signed "FL". O. O. 9 Bll. 8vo. 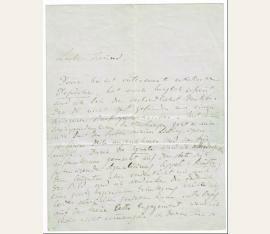 Draft letters that for the greater part do not have an identifiable correpondent and that show a lot of cancellations. 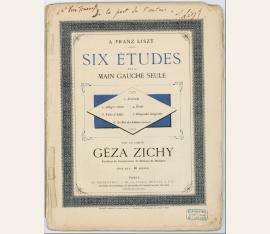 Amongst other things Liszt speaks about attacs on his person: "Before reading. 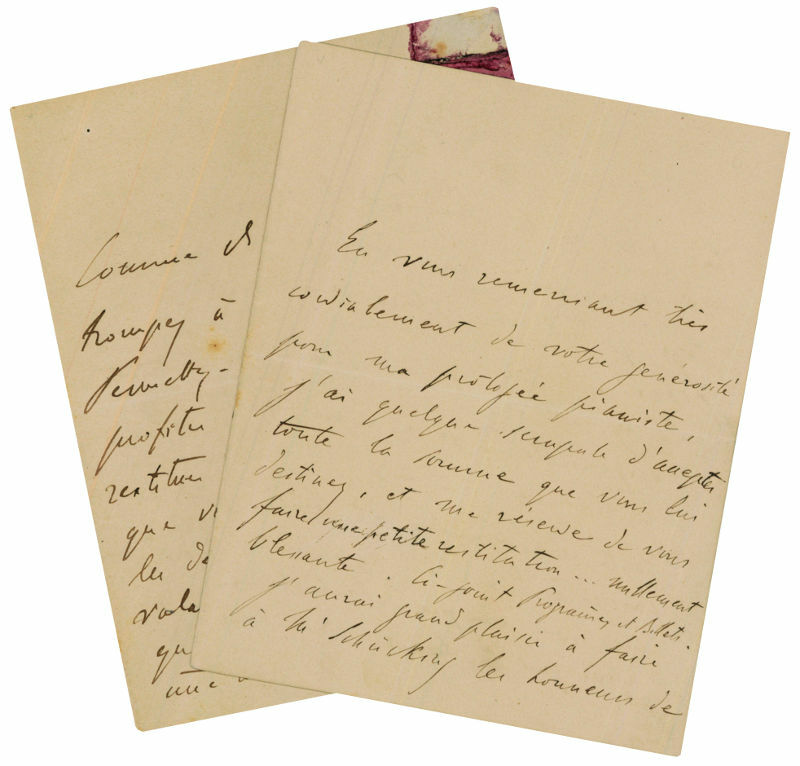 (to Mme P.) I have not yet read the recollections in question; but from what has come back to me from it, the author enjoys to make me just as ridiculous as detestable. [...] to some scandals I would not know what to oppose but tacit decency that does not entrap me at all and leaves others the burden of their debasement. [...] one or the other [has] previously written to me numerous letters of excitement about the nobility of my character and the straightness of my feelings. Concerning this, I will not deny at all and I will continue to ascribe to them their remarkbale and brilliant talents of Artists, writers and inventors, fully regretting that they so strongly turn them against my poor person (page no. 1). 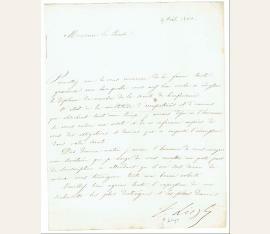 The sesond page can be identified as a draft letter to the Hungarian Nobleman Albert Apponyi (1846-1933), to whom Liszt writes about the Academy of Music in Budapest, his interest in Hungarian art and his desire to be useful for his country: "at the chamber of deputies the said academy would be useful to emphasize art in Hungary; [...] Can one not take into account similar precendents now and set back when one is concerned with going forward? I cannot and I position myself in your view as wisely as favourably. Despite of the difficulties of a situation confused by different obsessions and despite of the smallness of our financial means we definitely have to return to our plan and not become unmanagable. Regarding my 'personal conveniences' that you are so kind as to worry about, let me assure you once more that I do not aspire anything else than this: the peace to work in my room. Orare et laborare. The point of honour that noone but you will understand better attaches me to Hungary, our home country. Could I fill it with all my duty of recognition!" 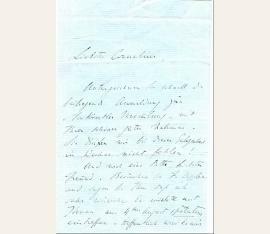 At the end of this side a fragement of a letter written in German can be found: "Honoured friend, Strongly attached to you with my heart and my spirit, I am rarely and insufficiently sad to be able to show you my sincere friendship. Many thanks for your kind letter and its joyful notification." 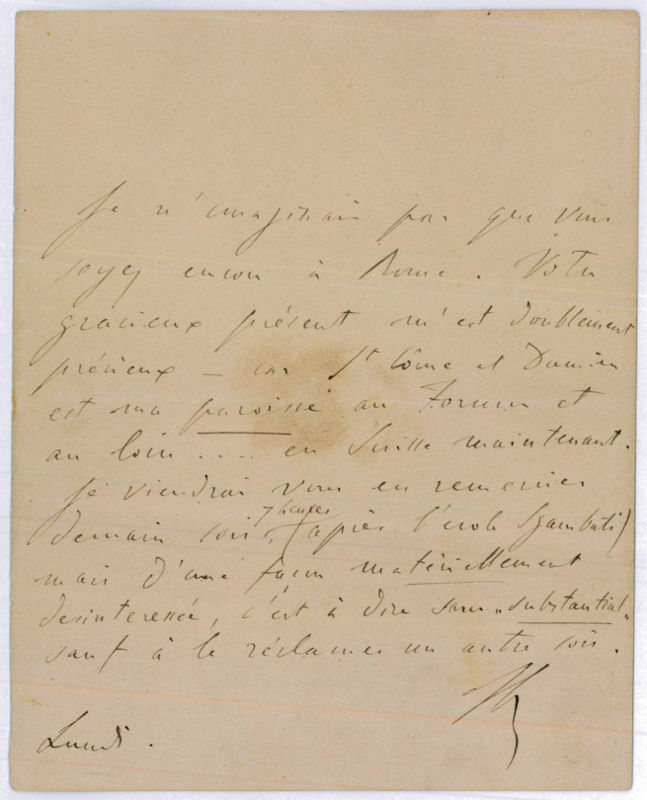 - In another draft Liszt mentions the Villa d'Este, Cosima and Wagner as well as his mother (Marie d'Agoult, alias Daniel Stern): "After your departure from the Villa d'Este I wrote to Cosima and also spoke to her about your last incriminated articles. 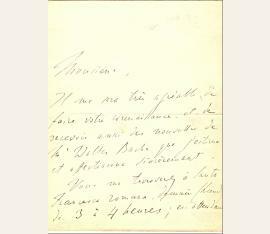 She answers to me [...] 'the Italien hou [...] seemed superbe to me'! But what did not at all seem superbe to me but on the contrary repellent, shameful and disgusting was the cunning and frivolous behaviour of Cosima's mother against her daughter. I mention it to you confidentially. [...] (page no. 3). 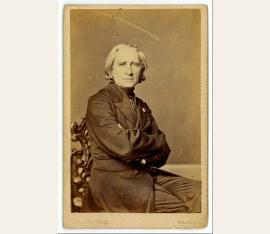 - Enclosed one photography of Liszt mounted on cardboard by Nadar, shortly before his death in 1886. 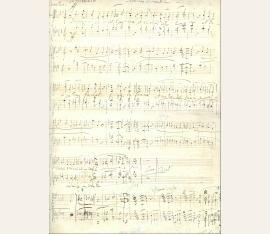 - Provenance: Robert Bory, musicologist..
Komponist und Pianist (1811-1886). 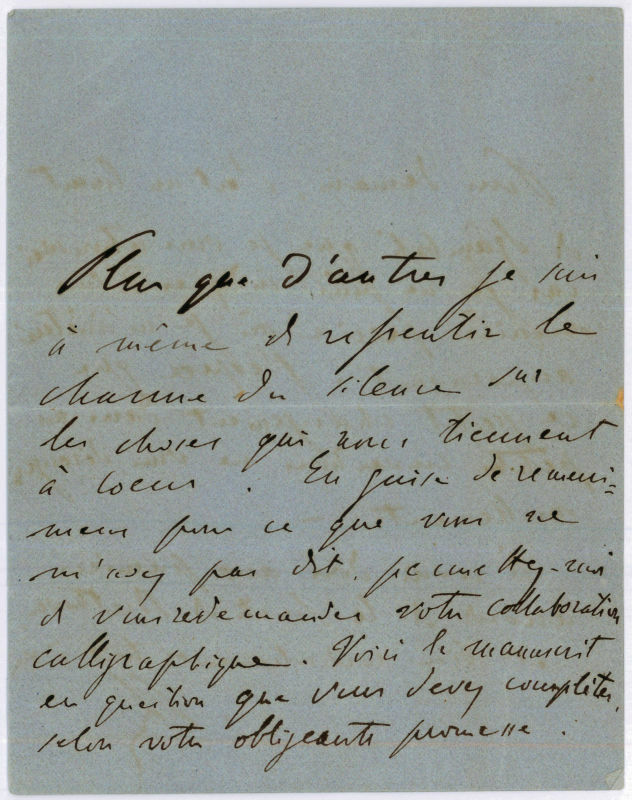 Autograph letter signed ("FL"). [Rom. 2½ SS. Kl.-8vo. To an unknown recipient, asking for calligraphic help regarding a manuscript: "More than others I am able to repent the charm of silence on the things that we take to heart [...] Let me ask you again for your calligraphic collaboration. Here is the manuscipt in question that you have to complete [...]". 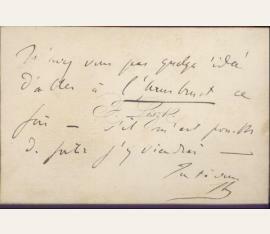 - Provenance: Robert Bory, musicologist. Komponist und Pianist (1811-1886). 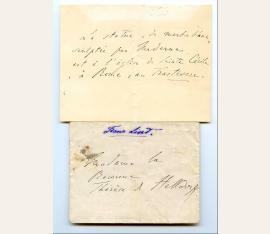 2 autograph letters signed ("FL"). "Dimanche" and "Dimanche matin", i. e. [Rom. 6 SS. Kl.-8vo. 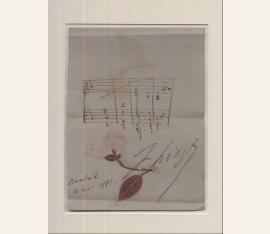 To an unknown recipient, apparently a wealthy music lover and possibly a patron of the composer. 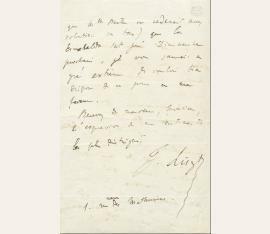 In one of the letters Liszt invites himself with a friend at the recipient's place for a moment of musical relaxation and returns 20 francs to him that he has paid too much for concert tickets. In the other letter the pianist transmits him programmes and tickets for a concert and proposes to "honour the sight of Madonna des Rosario" and to let his correspondent know. The composer's time seems to be filled with musical social commitments: "All of my week is planned until Friday". - Provenance: Robert Bory, musicologist. Komponist und Pianist (1811-1886). 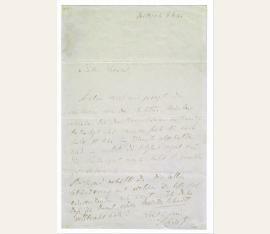 Autograph letter signed ("FL"). [Rom. 1 S. Kl.-8vo. To an unknown recipient. 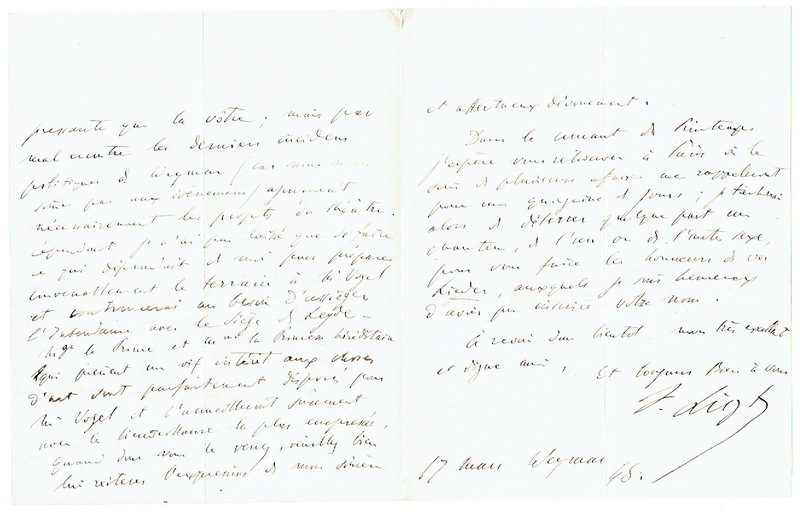 Liszt thanks his correspondent for his "gift", possibly an icon or an object showing Saint Cosmas and Damian and telling him that he will visit him to thank him personally "but in a way that is not interested in material things". He mentions the fact that Switzerland is far away for him at the moment. 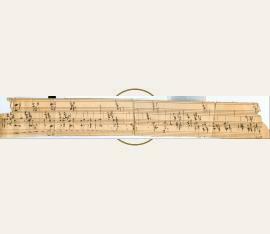 - Provenance: Robert Bory, musicologist. Komponist und Pianist (1811-1886). 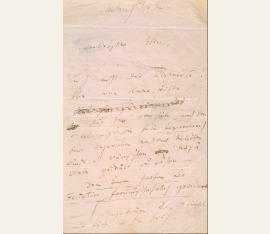 Autograph letter signed ("FL"). [Rom. 4 SS. Kl.-8vo. To an unknown recipient. Liszt is sick in Madonna del Rosario, he felt "very unwell walking up Monte Mario after having had dinner at the Vatican". He writes to confirm his presence at an important concert by Lippi despite his state of health. "After that [he will] endorse himself to eight days of imprisonment". His sicckness does not keep him from maintaining his social commitments with his correspondent, "Haxthausen and Mme Colban". - Enclosed a framed reproduction of the famous photography by Hanfstaengl that shows the pianist playing. - Provenance: Robert Bory, musicologist. Komponist und Pianist (1811-1886). Autograph letter signed. Weimar. 3 SS. 4to. 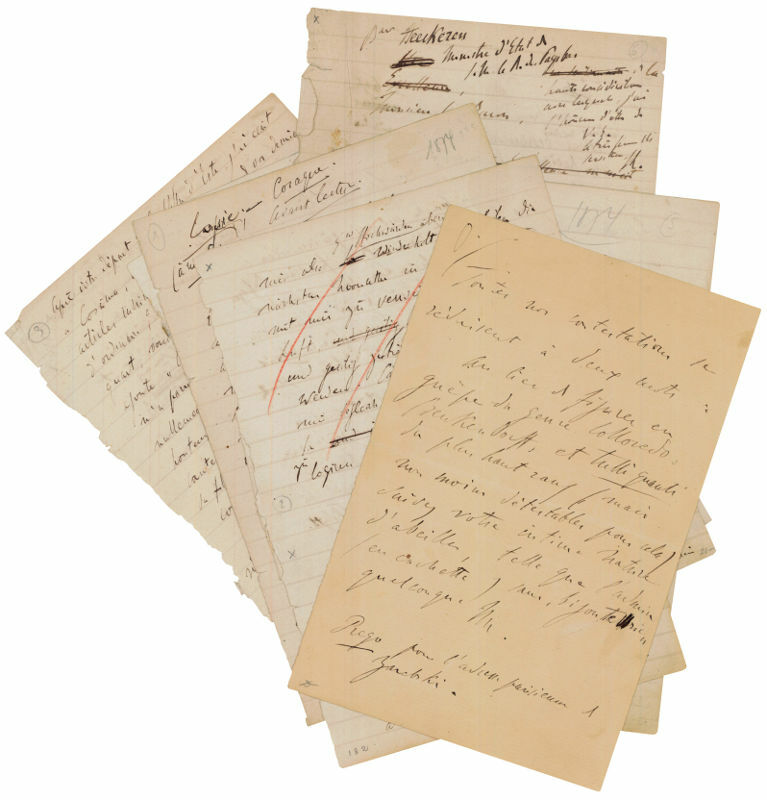 To the music publisher Carl Haslinger, asking him to have a look at "the arrangement for 2 pianofortes on which [he] has spent 3 days annotating and editing" in order to propose a new version, with many annotations for the piano and fewer parts for instruments. He also sends his Hungarian Rhapsody "properly instrumented" and asks Haslinger "to prepare a similar edition." 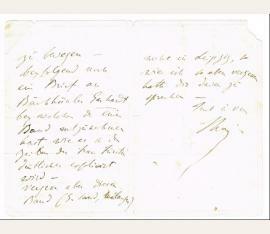 Liszt leaves for Zurich to stay with his friend Wagner. 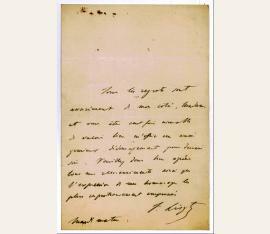 - Inserted in Robert Bory's book "The Life of Franz Liszt in Pictures" (Editions du journal de Genève, 1936, 1st numbered copy on Holland Van Gelder paper, bound in bordeaux leather). - Provenance: Robert Bory, musicologist. 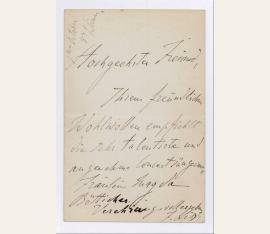 Together with several autograph letters signed by Alfred Cortot (2), Daniela Thode, Winifred Wagner, Bladine Gravina, and Daniel Ollivier..
Komponist und Pianist (1811-1886). Autograph letter draft, unsigned. O. O. 4 SS. 8vo. 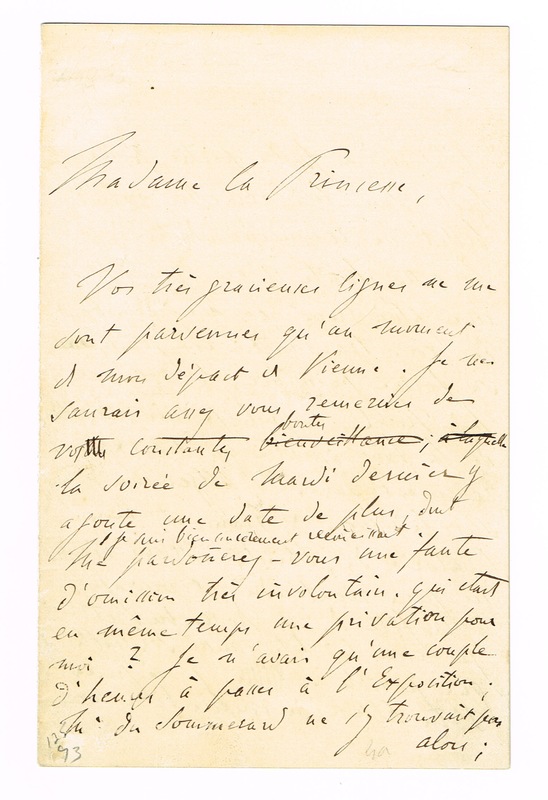 Letter to an unnamed correspondent, in which Liszt expresses his ideas for a concert which will be held at the Salle Erard in Paris and which will comprise several of his compositions. The name of Madame Marchesi is mentioned twice, once for her "benevolence" that seems to make the concert possible, and a second time for the provision of a "brilliant" student to sing the part of "Joan of Arc at the Stake" which is included in the programme. The name of the pianist Madame Montigny is also mentioned twice, above all to take part in the programme and to carry out the "Hungarian Rhapsody" or a "Concerto". 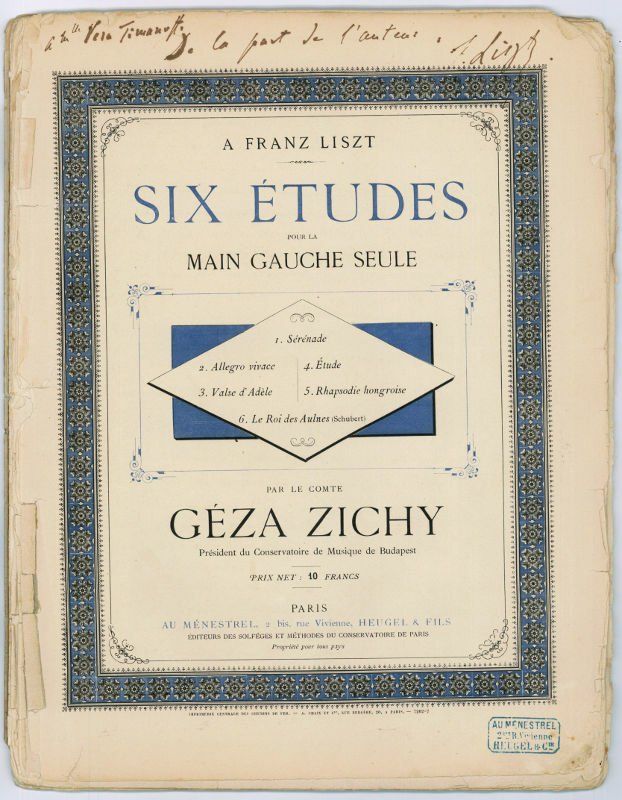 Liszt honours the literary personalities of his time by reminding that his "Preludes" are "after Lamartine", "Mazeppa after Victor Hugo" and "Joan of Arc at the Stake" after "Dumas". He also mentions the editors of the programmes of his compositions (Breitkopf, Schott, Taborsky). 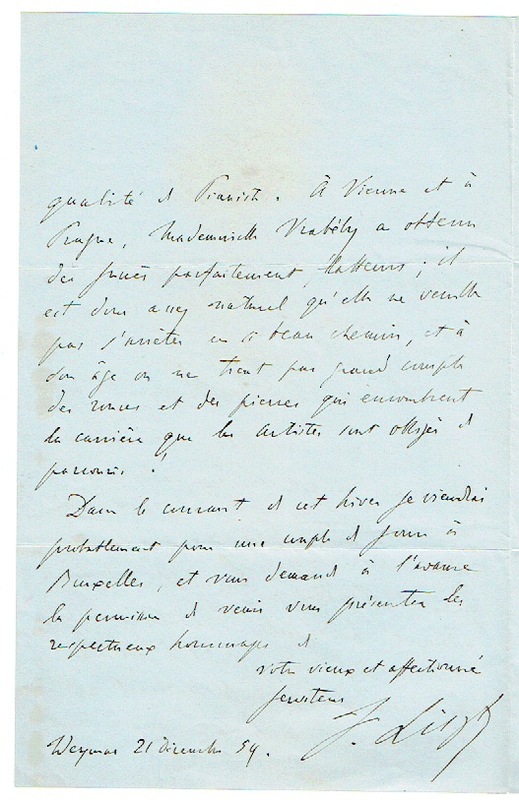 Liszt adds an NB: "I would not like to take the risk of a danse macabre because of the great orchestral noise that will do injustice to that of Mazeppa". 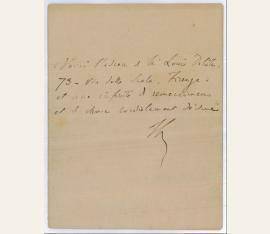 - Provenance: Family Nikita Magaloff and Joseph Szigeti..
compositeur et pianiste virtuose hongrois de l'Empire d'Autriche (1811-1886). 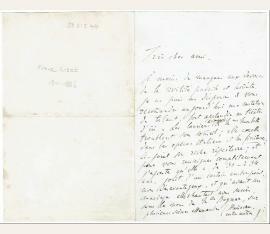 Autograph letter signed ("FL"). [Rome. ½ p. petit in-8. In French. 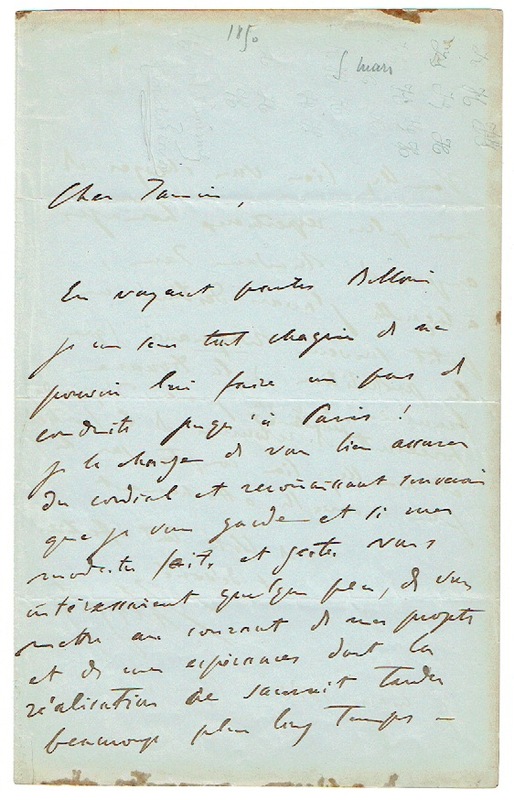 To an unknown recipient, giving him the address of the French composer Louis Delâtre: "Voici l'adresse de M. Louis Delâtre: 73, Via della Scala, Firenze: et une infinité de remercimens […]". - Provenance: Robert Bory, musicologist. Komponist (1811-1886). Autograph signature on printed concert announcement. (Paris. 1 S. 8vo. 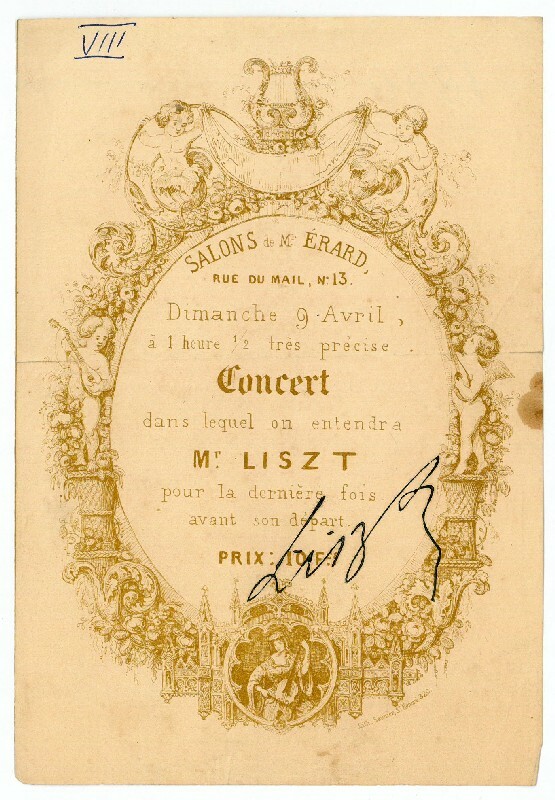 Signature ("Liszt") written across the Salon Érard concert announcement ("Concert dans lequel on entendra Mr. Liszt pour la dernière fois avant son départ"). - Dated (?) 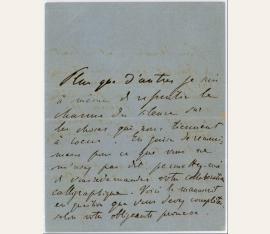 "1840" in pencil on the reverse; numbered "VIII" in blue ballpoint on recto. Austro-Hungarian composer (1811-1886). 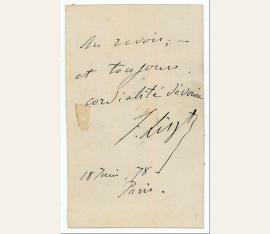 Autograph letter signed ("F. Liszt"). No place. 8vo. 1 p.
Asking a cashier to send him two tickets: "Ich ersuche den Herrn Cassir mir gefälligst zwey Parterre Billets für das heutige Conzert zu übersenden". Komponist und Pianist (1811-1886). 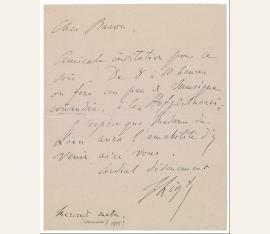 Autograph letter signed ("F. Liszt"). O. O. 2 SS. auf Doppelblatt. 8vo. 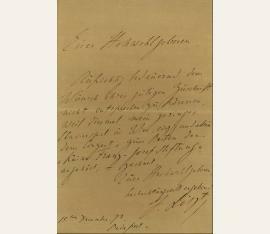 To Peter Cornelius ("Liebster Cornelius"), in German, telling him that he has just been informed that the full score of his opera, "Der Barbier von Bagdad", was not in the local theatre library as Cornelius had kept it, and asking that the score be sent to him by return, the trio being an essential part of the programme entitled "Performance of Manuscript Works of the Present Time". - Franz Liszt, Peter Cornelius's mentor and friend, was due to conduct a piece from Cornelius's controversial comic opera "Der Barbier von Bagdad" at the third concert of the Artists' Congress in Weimar on 7th August 1861. The opera was first performed at the Hoftheater in Weimar on 15th December 1858, amidst a hostile demonstration organised by the theatre director, Franz Dingelstedt, who was in conflict with Liszt and the so-called neo-German school of composition. 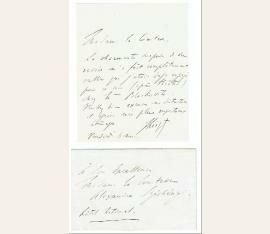 Liszt resigned his post after the fracas and both he and Cornelius left Weimar as a result. 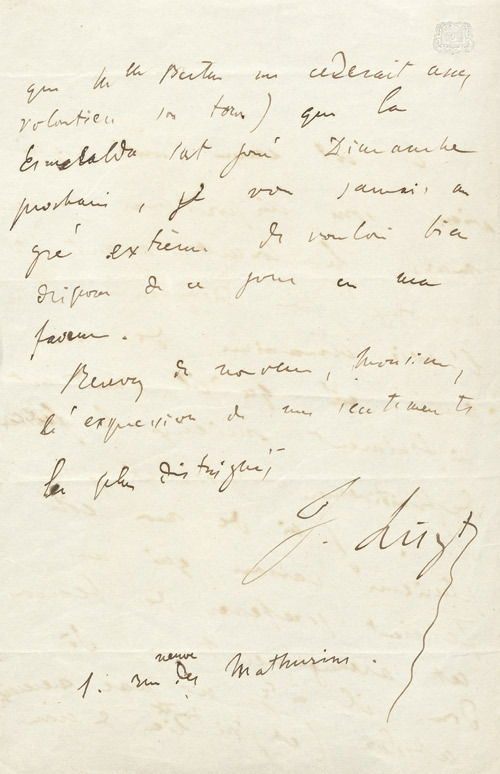 The opera was not played again in its entirety in the composer's lifetime but, as is clear from this letter, Liszt remained loyal to his friend and secretary, and continued to champion his work. According to Grove, Cornelius was a "gifted independent composer" who "may have been the composer from the Liszt circle who, after Liszt and Wagner themselves, most successfully realised the musical ideals of the New German school, albeit in a highly personal idiom" (New Grove Dictionary of Music and Musicians VI, 477)..
Komponist und Pianist (1811-1886). 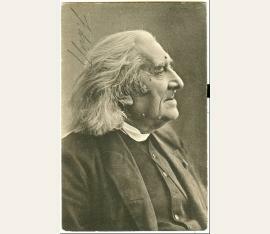 Portrait photograph signed ("F. Liszt"). [Wien. 92:58 mm. 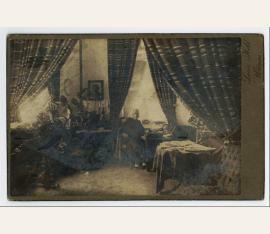 Vintage albumen print from the studio of Fritz Luckhardt, Vienna. Komponist und Pianist (1811-1886). Eigenh. Brief mit U. ("F. Liszt"). Weimar. 1 S. auf Doppelblatt. 8vo. An einen Musikverleger: "Nach aufmerksamer Durchsicht meines 'Bülow Marsch' von Herrn K. Goepfart, - ein junger talentvoller Componist - empfiehlt Ihnen zur baldigen Herausgabe diese Partitur freundlichst | F. Liszt". - Leicht gebräunt. Auf dem 2. 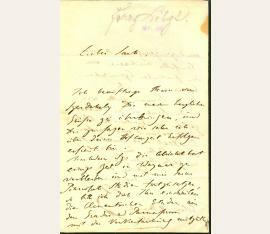 (leeren) Blatt Stempel einer privaten Liszt-Sammlung. - Goepfart war ein Mitglied der Donnerstagsrunde bei Liszt. Nach Eintritt in den Militärdienst war er bis 1880 Regimentsmusiker. In dieser Zeit entstanden vor allem Um-Instrumentierungen von Werken Liszts und anderer sowie kleinere Arbeiten (Märsche, Lieder, Kammermusik). Franz Liszt (1811-1886), Komponist. E. Widmung m. U., Weimar Mai 82. 8°. 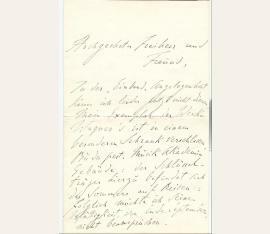 „Für Leontine Rohlfs freundlichst dankend F. Liszt“ – Widmung auf einem Blatt vor dem Titel von: Carmen Sylva, [d. i. Elisabeth, Königin v. Rumänien]. Jehovah. Lzg., Friedrich, 1882. 8°. 84 SS., 5 Bll. Hldr. d. Zt. mit etwas Rverg. u. Kopfgoldschn. - Kosch II, 483. – Erste Ausgabe. – Einbd. etwas beschabt. 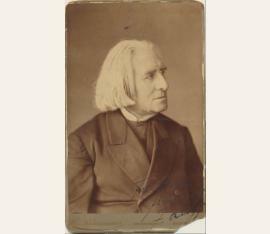 Franz Liszt (1811-1886), Komponist und Pianist. E. Brief mit U., Weimar, 27. Juni 1882, 3 Seiten 8°. Bezeichnung von fremder Hand auf der vierten Seite. An einen „verehrten Freund“ (möglicherweise Friedrich Hegar in Zürich). „Ich bedaure dass wegen Simroks Kleinigkeit Brahms’ Concert in dem Züricher Programm nicht Platz nimmt. Robert Freund möge nach seinem Belieben die Ersatz Nummer mit Orchestre bestimmen. Jedenfalls wird er die meisterhaft vortragen. Sophie Menter habe ich gerathen 2 Solopiecen (also ohne Orchesterbegleitung) zu wählen. Schreiben Sie ihr, ohne Verzug 84, New Bond Street, London.“ – Und in einer längeren Nachschrift: „Bechstein gehört nicht zu den gewöhnlichen, mehr oder minder reichen Pianoforte Fabrikanten. Seit vielen Jahren hat er sich stets sehr ehrenwerth erwiesen und wird gewiss auch in Zürich seinen Namen beehren. Haben Sie Nachricht von Saint-Saëns, der mir schrieb dass er der Züricher Tonkünstler Versammlung beiwohnen, und selbst sich durch einen seiner ausserordentlichen Orgel Vorträge betheiligen wollte?“ – Sophie Menter war Schülerin von Liszt und bis zu seinem Tod mit ihm befreundet; er hielt sie für die beste Pianistin ihrer Zeit, sein letztes Klavierkonzert ist ihr zugedacht. – Der Zürcher Komponist Robert Freund gehörte ebenfalls zu Liszts Freundeskreis. 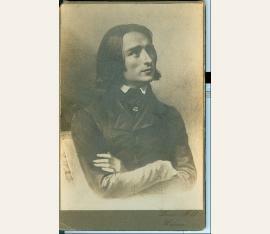 Franz Liszt (1811-1886), Komponist und Pianist. E. Brief mit U., Erlau 11. Dezember 1850, 2 Seiten 8°. Mit Trauerrand. Doppelblatt. Bleistiftbezeichnung am Oberrand von anderer Hand. „Lieber Sack, Ich beauftrage Herrn von Szerdahely Dir meine herzlichen Grüße zu überbringen, und Dir zu sagen wie sehr ich über Deine Hofconzert Erfolge erfreut bin. Nachdem Sz: Die Absicht hat einige Zeit in Weymar zu verbleiben und mit mir seine Pianoforte Studien fortzusetzen, so bitte ich Dich Ihm einstweilen die Clementischen Etüden aus dem Gradus ad Parnaßum mit der Vervierfachung mitzutheilen und zu zeigen so wie ebenfalls mehrere von den practischen Czernischen Exercicien – etc – Mitte Januar wollen wir wieder frisch an die Arbeit gehen – einstweilen bleibe recht gesund und wacker […]“. 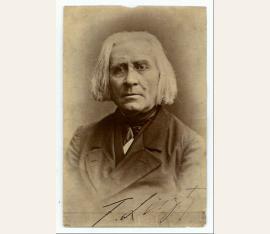 Franz Liszt (1811-1886), Komponist und Pianist. E. Brief mit U., Nonnenwerth, 10. 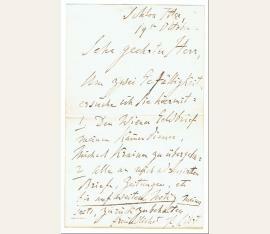 Oktober 1841, 3 Seiten 8°. Brief in französischer Sprache an einen nicht genannten Empfänger, der ihn offenbar um ein Darlehen gebeten hatte. „Ne sachant comment vous faire parvenir la petite somme que vous me demandez (vu l’absence de banquier à Nonnenwerth – et même à Bonn si je ne me trompe) j’écris en même temps à Schott, Mayence pour lui enjoindre de tenir les Cent francs à votre disposition et de vous les faire parvenir à l’endroit que vous lui indiquez […] Ne devant point retourner sitôt à Paris, je vous prierai de laisser courir les intérêts sans qu’il soit davantage question de prêt entre nous. 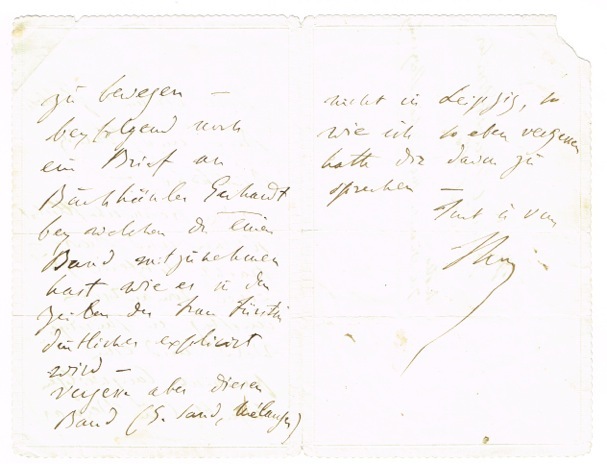 Si par hasard votre chemin vous conduisait du coté de Leipzig et Berlin en Novembre ou Décembre, venez me voir et nous causerons d’autre chose […]“ – Liszt hat in den Jahren 1841-43 die Sommermonate mit Marie d’Agoult und den Kindern jeweils auf der Insel Nonnenwerth im Rhein zugebracht und dort auch einen Baum gepflanzt, die sogenannte Liszt-Platane. Franz Liszt (1811–1886), Komponist. E. Brief mit U. („F. Liszt“). Boulogne, 6. Mai 1841. 3 SS. auf Doppelblatt. 8°. – Kurz vor einer Reise nach England stehend an einen Violinisten, der sich darüber beklagt hatte, daß er bei Liszts Pariser Konzert zugunsten des Bonner Beethoven-Denkmals nicht berücksichtigt worden war. Da aber Berlioz als Dirigent auf dem Konzertplakat genannt war, so sei es nur schicklich gewesen, daß dieser ihn bitten würde zu kommen. Er selber habe es aus Taktgefühl nicht getan, was er sicherlich verstehen werde: „[...] Berlioz vous a ecrit dans ma chambre, et sur la demande que je lui en ai faite. L’affiche du concert portant le nom de Berlioz comme chef d’orchestre, la convenance exigeait ce me semble que ce fut lui qui vous priat de venir. Quant à moi je m’en suis abstenu par une raison de delicatesse que vous apprecierez j’en suis persuadé“. – Es hätte für ihn nur eine Möglichkeit gegeben, seine Anwesenheit beim Konzert zu fordern, und das wäre gewesen, ihn zu bitten, ob er mit ihm zusammen die Beethovensonate ansagen würde, denn er hatte schon 4 Jahre zuvor Massart sein Versprechen gegeben, welches er unmöglich zurückziehen konnte. Die sie verbindende tiefe Sympathie und Freundschaft sähe er dadurch nicht in Mitleidenschaft gezogen: „Il n’y avait qu’une manière pour moi, de reclamer votre présence à ce concert; c’etait de vous prier de dire la sonate de Beethoven avec moi. Ma parole etant donné depuis 4 ans à Massart, il m’a été impossible de la lui retirer. Cette petite explication ne peut laisser aucun doute dans votre esprit ce me semble et je me plais à croire que nos rapports de serieuse amitié, de sympathique devouement, n’en seront pas troublés [...]“. – Bei dem von Berlioz dirigierten Konzertabend zugunsten des Beethoven-Denkmals am 24. April 1841 spielte Liszt zusammen mit dem belgischen Violinisten Lambert Joseph Massart Beethovens Sonate für Klavier und Violine op. 47. – Mit mehreren kleinen alt hinterlegten Einrissen und stärkeren Faltspuren; etwas unfrisch. – Beiliegend ein in Liszts Namen geschriebener Brief an Pastor Winkler in Erfurt (dat. Weimar, 23. Oktober 1883. 1 S. auf Doppelblatt. Gr.-8°. Mit hs. adr. Kuvert). Franz Liszt (1811–1886), Komponist. E. Brief mit U. („F. 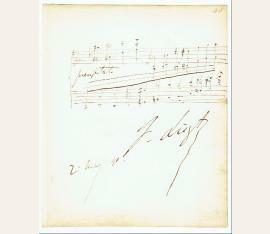 Liszt“). Weimar, 13. September 1855. 1 S. auf Doppelblatt. 8°. Mit e. adr. Kuvert. 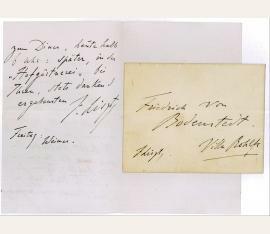 – An Wilhelm Popp (1828–1902), Pianist und Flötisten am Herzoglich Sächsischen Hoftheater zu Coburg-Gotha: „Mit bestem Dank bestätige ich Ihnen den Empfang des Dedications Exemplares Ihrer Conzert Polca [...]“. – Wilhelm Popp erfuhr seine flötistische Ausbildung durch Kaspar Kummer und Louis Drouet. 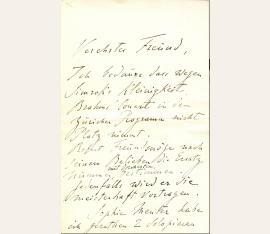 Nach langjähriger Tätigkeit am Hoftheater zerstritt er sich mit der Theaterintendanz und übersiedelte 1867 nach Hamburg, wo er Soloflötist am Philharmonischen Orchester wurde. Von seinen fast 600 überwiegend für Flöte und Klavier verfaßten Kompositionen werden heute kaum noch welche verlegt. Seinerzeit hingegen war Popp ein bekannter und geschätzter Komponist, in David Ehrlichs „History of the Flute“ werden seine Werke als „very well known in the musical world“ geführt. Daneben schrieb er mehrere Lehrwerke für Flöte und nicht zuletzt eine „Geschichte der Musik. Portraits, Biographien und Proben aus den Werken der berühmtesten Tondichter des 18. und 19. Jahrhunderts“. – Beiliegend ein in Liszts Namen geschriebener Brief an Robert Lienau von der Schlesingerschen Musikhandlung in Berlin (dat. Weimar, 31. Februar 1884. 1 S. auf Doppelblatt. Gr.-8°. Mit hs. adr. Kuvert). Franz Liszt (1811–1886), Komponist. Kabinettphotographie mit e. Namenszug auf der Bildseite. O. O. u. D. [um 1882]. 166:111 mm. – Schönes Altersportrait im Profil nach rechts aus dem Atelier aus dem renommierten Budapester Atelier Ferencz Kozmata, entstanden im Nov. 1873 anläßlich v. Liszts 50jähr. Künstlerjubiläum (vgl. Ernst Burger. 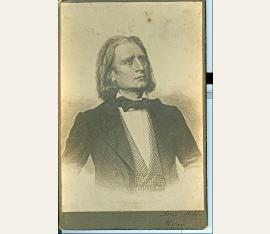 Franz Liszt in der Photographie seiner Zeit. Mchn. 2003. Nrn. 108 u. 110). Auf der Bildseite signiert, rückseitig Widmung an den Dirigenten Felix Mottl, der am 6. Mai 1881 in Baden-Baden ein Konzert mit Werken Liszts dirigiert hatte. – Originalkarton unten gering beschnitten, deshalb rücks. tlw. Verlust der Buchstaben "Fe" in der Widmung. Franz Liszt (1811–1886), Komponist. „Pro Papa“. E. Musikmanuskript m. U. („F. Liszt“). O. O., . 3 SS. auf Doppelblatt. Folio. – Stichvorlage des Chorals für Männerchor und Orgel von Liszts eigener sowie von Schreiberhand. Im einzelnen umfaßt das vorliegend Manuskript 2 von Schreiberhand stammende SS. „Pro Papa (I)“ mit den Stimmen für Tenor und Baß sowie der Notation für Orgel in vier jeweils vierzeiligen Systemen mit kleinen e. Anmerkungen Liszts sowie einem e. Postludium von 18 Takten in zweizeiligem System. „Pro Papa (II) Dominus conservet Eus“ mit den Stimmen für Sopran, Alt, Tenor und Baß sowie Orgel auf S. 3 stammt zur Gänze aus Liszts Hand und ist notiert in zusammen 12 Zeilen (d. s. vier Systeme zu je vier bzw. zwei Zeilen), tls. mehrfach e. korrigiert und am unteren Blattrand wie oben angeführt signiert. – Raabe 523; LWV J39; Searle 1228 und 1229. – In schwarzer Tinte; mit einigen kleinen, wohl von Liszt im Zuge der Bearbeitung herstammenden Schabstellen; im Mittelfalz etwas eingerissen; insgesamt von guter Erhaltung. Franz Liszt (1811–1886), Komponist. E. Brief mit Initialen. O. O., „Mittwoch früh 18. Dec.“ o. J. [wohl Ende 1839]. 2 SS. auf Doppelblatt. Gr.-8°. Mit e. Adresse (Faltbrief). 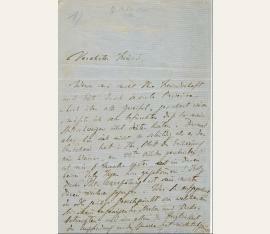 – An den Komponisten und Musikverleger Tobias Haslinger (1787–1842): „Noch nicht die Winterreise! Blos[s] eine kleine Bitte. Auf der 1ten Seite (nach dem Titel – so wie beim Hexameron) der Ungarischen national [!] Melodien würde ich wünschen diese Worte gedruckt zu sehen – Dem Herrn Grafen Leo Festetics freundschaftlich gewidmet – Angekommen um 3 Viertel auf fünf in der Früh [...] Morgen nach dem Concert schreibe ich Ihnen etwas mehreres [...]“. – Die Graf Festetics gewidmeten „Ungarischen Nationalmelodien“ (Nr. 1 bis 6; vgl. Grove 242) sollten 1840 bei Haslinger in Wien erscheinen. 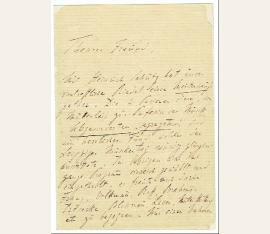 Liszt selbst war Ende 1839 zum ersten Mal seit seiner Kindheit in Ungarn gewesen. „Dieser Aufenthalt wird zu einer einzigen Ekstase, die den umjubelten Meister sehr für das Land seiner Geburt einnahm. 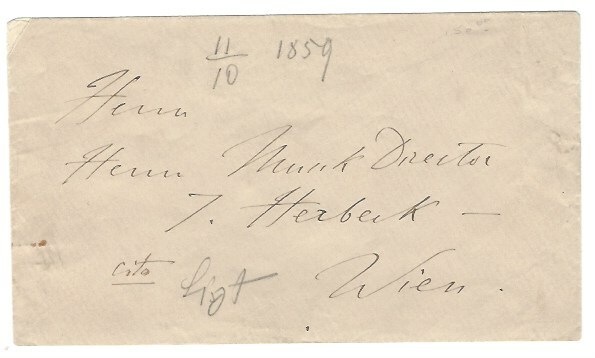 Ein Berichterstatter schrieb, daß Liszt in Budapest in ungarischer Festtracht spielte. Nach dem Konzert ‚traten sechs Magnaten und adlige Magistratspersonen in vollem, prächtigen Nationalkostüm hervor, und Graf Leo Festetics überreichte ihm einen Säbel, dessen Scheide, silbern und vergoldet, von alter getriebener Arbeit, reich mit Edelsteinen besetzt war [...]’“ (Everett Helm: Franz Liszt. Mit Selbstzeugnissen und Bilddokumenten. Reinbek bei Hamburg, Rowohlt, 1990 (= rm 185), S. 56). – Bl. 2 mit kleinem Ausschnitt durch Öffnen der Verschlußmarke (keine Textberührung) und Resten derselben. Franz Liszt (1811–1886), Komponist. E. Brief mit U. („F. Liszt“). Weimar, 28. Juli 1880. 2 SS. auf Doppelblatt. Gr.-8°. – An den namentlich nicht genannten Schriftsteller Hans Frh. von Wolzogen (1848–1938): „In der ‚Einband’ Angelegenheit kann ich leider jetzt nicht dienen. Mein Exemplar der Werke Wagner’s ist in einem besonderen Schrank verschlossen, Budapest, Musikakademie Gebäude: der Schlüsselträger hierzu befindet sich des Sommers auf Reisen [...] ‚Was Styl ist’ hat uns Wagner siegreich bewiesen und gelehrt. Sie, hochgeehrter Freund, erörtern vortrefflich in ihrer letzten Schrift die grosse Sache. Dass eine ‚Stylbildungs Schule in Bayreuth’ festgestellt werde, wünscht niemand ernstlicher als Ihr aufrichtig ergebenster F. Liszt [...]“. Bedankt sich ferner für „die Mittheilung ihres meisterhaften ‚Leitfaden durch Tristan und Isolde’“. – Wolzogens „Thematischer Leitfaden durch die Musik von Richard Wagner’s Tristan und Isolde“ a. d. J. 1876 erlebte zahlreiche Auflagen und Übersetzungen. – Bl. 2 mit winzigem Einriß im Mittelfalz, sonst sehr wohlerhalten. 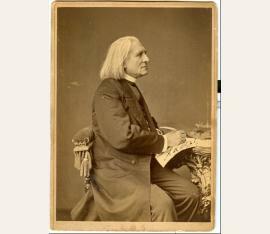 Franz Liszt (1811–1886), Komponist. E. Brief mit U. („F. Liszt“). Bayreuth, 27. Juli 1882. 1 S. auf Doppelblatt. Gr.-8°. – An den namentlich nicht genannten Schriftsteller Hans Frh. von Wolzogen (1848–1938) am Tag nach der Uraufführung von Wagners „Parsifal“: „Bei und nach der gestrigen Darstellung von Wagners ‚Parsifal’ war der allgemeine Eindruck, dass sich über dieses Wunderwerk nichts sagen lässt. Ja wohl, verstummt es die davon tief ergriffenen: Sein weihevolles Pendel schlägt vom Erhabenen zu dem Erhabensten [...]“. – Leichte Gebrauchsspuren, insgesamt sehr wohlerhalten. Franz Liszt (1811–1886), Komponist. E. Brief mit U. („F. Liszt“). Weimar, 25. April 1882. 2 SS. auf Doppelblatt. 8°. – An den namentlich nicht genannten Schriftsteller Hans Frh. von Wolzogen (1848–1938): „Ihre ‚Leitfäden’ sind eine gedeihliche Bereicherung der Musik-Litteratur. Sie fördern wesentlich das geistige Verständniss [!] der grossen, erhabenen, einzig dastehenden Schöpfungen Wagner’s. Bereits gelten auch die ‚Leitfäden’ für classisch, und mit Recht, weil sie als Musterarbeiten Schule machen [...] Auf freundschaftliches Wiedersehen im Parsifal [...]“. – Drei Monate darauf, am 26. Juli, sollte in Anwesenheit Liszts die Uraufführung des „Parsifal“ in Bayreuth unter Wagners Leitung stattfinden; Wolzogens „Thematischer Leitfaden durch die Musik des Parsifal“ erlebte in demselben Jahr bereits vier Auflagen. – Sehr wohlerhalten. Franz Liszt (1811–1886), Komponist. Musikmanuskript mit e. Widmung und U. („F. Liszt“). Weimar, 30. Juli 1880. 4 SS. auf 2 Doppelblatt. Großes Querformat. In Leinenschirting geheftet. Mit Umschlag. 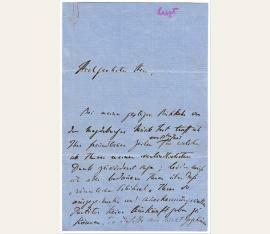 – Von fremder Hand verfaßte Reinschrift von Liszts Lied „Verlassen“ für eine Singstimme und Klavier nach dem Text aus dem Schauspiel „Irrwege“ von Gustav Mitchell, dem Liszt am Schluß die Komposition „freundlichst ergeben“ widmet. – Etwas gebräunt und mit kleinen Randläsuren. Franz Liszt (1811–1886), composer. ALS (“F. Liszt”). 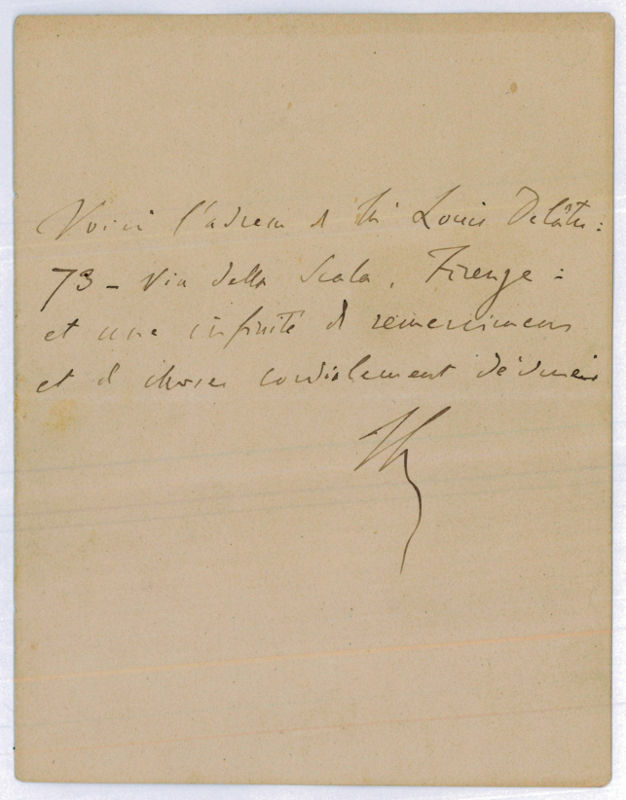 Rome, 10 July 1862. 4 pp. on double leaf. Large 8vo. 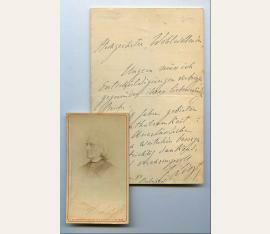 – To the (unnamed) Weimar state official Franz Müller (1806–1876), a friend of Liszt and an early admirer of Wagner, whom he thanks for having sent him a “Weimar memento” which reached him only now, eight months later. 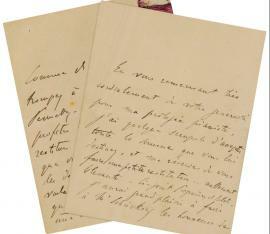 He continues to plead for Wagner’s cause: “[...] How can I thank you? I truly do not know. Let me only say that you have made me happy and have encouraged me, and may you always draw the noblest satisfaction from knowing that you have grasped art and are advancing it in the true sense that Plato called an ‘arousal of concord, mutual harmony, and the science of love’ [...] For today, please permit me to emphasize one point especially – a principal point, I might add – which concerns the end of your essay. There seems to be an interest in Weimar to provide their music with a dynamic and worthy director. Between ourselves, I have received written information to this effect. 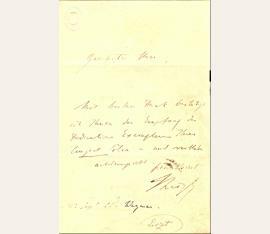 Of course, my response occasioned a renewal of my ten-year old suggestion (oft repeated since) to appoint Richard Wagner. What serious obstacle might now present itself – after his having received a full pardon in Saxony? Who could doubt the extraordinary renown and usefulness of his being installed at Weimar – for Weimar, first of all? [...]”. – Richard Wagner had participated in the Dresden insurrection of 1849 and, like his friends Gottfried Semper and August Röckel, had been compelled to flee Saxony after the uprising had been crushed. Wagner had flown to Switzerland and to Paris, then back to Zurich; after being pardoned in 1862 he could once more travel to his native Leipzig, where he gave concerts. While he was again to meet Liszt in Weimar, he never would assume the post of Generalmusikdirektor there. Franz Liszt (1811–1886), Komponist. E. Brief mit U. („F. Liszt“). O. O. [Rom], 19. April 1868. 2 SS. auf Doppelblatt. Kl.-8°. 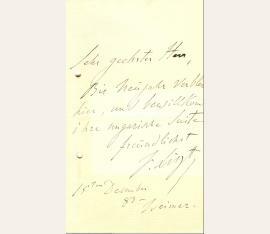 – An den namentlich nicht genannten Musikschriftsteller George Grove (1820–1900) mit dem Ausdruck seiner Freude ihn zu sehen und Neuigkeiten von Walter Bache zu erfahren „que j’estime et affectionne sincèrement“. – Der Pianist und Dirigent Walter Bache (1842–1888) hatte zwischen 1862 und 65 Unterricht bei Franz Liszt genommen; nach seiner Rückkehr nach London „began a lifelong crusade to winning popularity for Liszt’s works in England” (Wikipedia, Abfrage v. 28. II. 2009). – Etwas gebräunt und angestaubt sowie mit winzigem Einriß im unteren Mittelfalz. Franz Liszt (1811–1886), Komponist. E. Briefkärtchen mit U. („F. 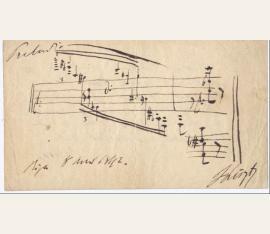 Liszt“). Rom, 25. August 1868. 1 S. 32°. Mit e. Adresse verso. 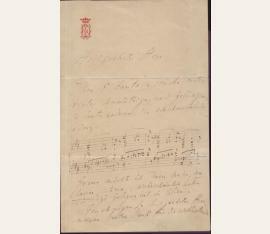 – An den Musikschriftsteller George Grove (1820–1900) mit der Mitteilung, daß ihre musikalische Zusammenkunft am folgenden Tag stattfinden werde. – Gering fleckig und etwas angestaubt. Franz Liszt (1811–1886), Komponist. E. Brief mit U. („F. Liszt“). Weimar, 12. Juli 1861. 2¾ SS. auf Doppelblatt. 8°. 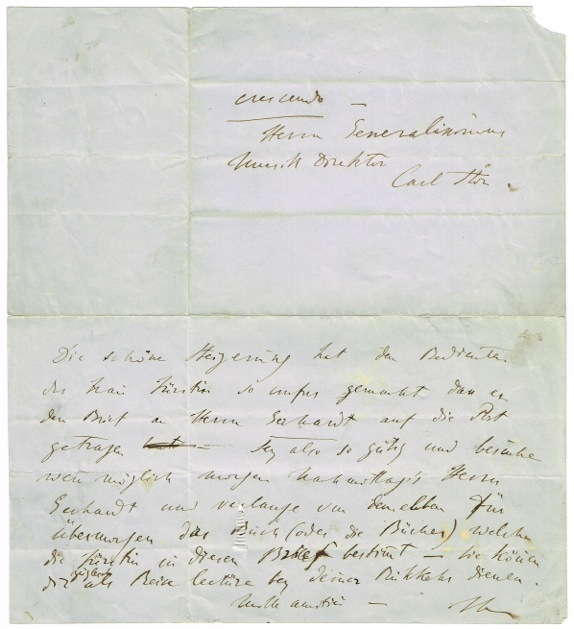 – An den Komponisten und Dichter Peter Cornelius (1824–1874): „Unterzeichnen Sie schnell die beiliegende Anmeldung zur ‚Tonkünstler Versammlung’ mit Ihrem schönen guten Nahmen [!]. Sie dürfen mir bei dieser Gelegenheit in Weimar nicht fehlen! Und noch eine Bitte, liebster Freund. Besuchen Sie F[ranz] Doppler und sagen Sie Ihm daß ich sehr wünsche Er möchte mit Ihnen am 4ten August spätestens eintreffen. Hoffentlich wird Er mir diese Freude nicht versagen – und wenn es Ih[m] nicht besonders ungelegen ist wird er seine Flöte mitbringen und die Parthie im Faust übernehmen [...] Eduard [d. i. Liszts Cousin, 1817–1879] treffen Sie hier – und auch Wagner, Hans, Dräseke, Damrosch, Tausig, Lassen, und meine Tochter (Mme Ollivier)[.] Auf Wiedersehen also, mein Bester Cornelius. Bringen Sie Ihren Cid mit soweit er fertig ist [...]“. – Mit stärkeren Faltspuren und kleineren Läsuren; die Verso-Seite von Bl. 2 mit einem schmalen Montagestreifen an der Faltung; ohne die erwähnte Anmeldung. E. musikalisches Albumblatt mit Widmung und U. sowie Initialen. Franz Liszt (1811–1886), Komponist. [„An die Künstler”]. E. musikalisches Albumblatt mit Widmung und U. sowie Initialen. Weimar, Mai 1870. 1 S. Qu.-schmal-folio. – Zehn Takte für Klavier aus dem Festgesang nach Schiller für Solostimmen, Männerchor und Orchester (1853; Searle 70) „zu freundlicher Erinnerung an die Tonkünstler Versammlung“. – Stärker angestaubt und etwas fleckig, kleinere Faltspuren (deren eine alt hinterlegt). Franz Liszt (1811–1886), Komponist. E. Brief mit U. („F. Liszt“). Rom, 1. Januar 1866. 2 SS. auf Doppelblatt. Kl.-8°. – An einen „illustre ami“, dem er die Prinzessin Palazzolo vorstellt: „Madame la Princesse Palazzolo veut bien me demander un mot qui lui procure le plaisir de faire votre connaisance. Elle joint à beaucoup d’esprit un goût très cultivé des beaux arts et trouve avec raison que c’est un contresens d’habiter Naples sans vous voir [...]“. – Sehr wohlerhalten. Franz Liszt (1811–1886), Komponist. E. Brief mit U. („F. Liszt“). O. O. u. D. 3½ SS. auf Doppelblatt. Gr.-8°. – Wie von fremder Hand in Bleistift auf Bl. 1 recto vermerkt an Madame Vieuxtemps über Terminfestlegungen des Großfürsten für ein Hofkonzert zu Ehren Vieuxtemps’ am 19. April und für ein weiteres Konzert am Theater zugunsten einer Wohltätigkeitseinrichtung am 16. April, für die Vieuxtemps freundlicherweise auch seine sehr effektive Unterstützung zugesagt habe. Aus diesem Grunde sei es notwendig, daß sie bereits am Morgen des 15. in Weimar sei, damit sie noch hinlänglich proben könnten. Sie möge ihm dann auch die beiden Stücke nennen, die Vieuxtemps ausgesucht habe. Er selbst würde sein Concerto vorschlagen und den Abend mit einer Fantasie mit Orchesterbegleitung beenden: „[…] le Grand Duc a fixé le Concert de Cour en l’honneur de Vieuxtemps au mercredi (de la semaine de Pâques) 19 avril. Celui du théâtre au bénéfice de quelqu’œuvre de bienfaisance pour lequel Vieuxtemps veut bien aussi avoir la très bonne grace de nous préter son très effectif concours aura toujours lieu le 16 puisque cette date (Dimanche et Pâques) lui convient. Il sera donc nécessaire que vous soyez à Weymar le samedi matin 15 avril afin que nous puissions répéter convenablement, et que vous ayez la bonté de m’indiquer les deux morceaux que Vieuxtemps choisira. En premier lieu j’ose réclamer son Concerto – et pour terminer la soirée une Fantaisie (avec accompagnement d’orchestre) […]“. – Auf dunklerem, leicht gebräunten Papier. Franz Liszt (1811–1886), Komponist. E. Schriftstück o. U. O. O. u. D. 1 S. auf Doppelblatt. Qu.-8°. Mit e. adr. Kuvert. – An Therese Freifrau von Helldorff: „La statue ‚de marbre blanc’ sculptée par Maderne, est à l’église de Sainte Cécile à Rome, au Trastevere“. – Gemeint ist die Statue der Heiligen Cäcilia von Stefano Maderno. – Etwas lichtrandig und mit einer kleinen Schabspur am oberen Rand der Recto-Seite von Bl. 1; der Umschlag etwas angestaubt und fleckig. Franz Liszt (1811–1886), Komponist. E. Brief mit U. („F. Liszt“). Budapest, 18. Februar 1880. 1 S. auf Doppelblatt. 8°. Mit einer Beilage (s. u.). – An einen namentlich nicht genannten Adressaten: „Ungern muss ich Entschuldigungen vorbringen gegenüber Ihren liebenswürdigen Briefen. Meine 68 Jahre gebieten mir Enthaltsamkeit: nur das Unerlässliche kann ich weiterhin besorgen [...]“. – Beiliegend eine Portraitphotographie mit faks. 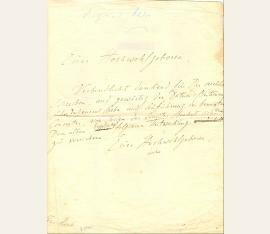 Namenszug i. F. 88:55 mm auf etwas größerem Trägerkarton im Verlag von T. F. A. Kühn in Weimar. Franz Liszt (1811–1886), Komponist. Visitenkarte mit lithographiertem Unterschriftenfaksimile („F. Liszt“). O. O. u. D. 1 S. Großes Visitkartenformat. – Auf weißem Glanzpapier; die Ränder etwas oxydiert. 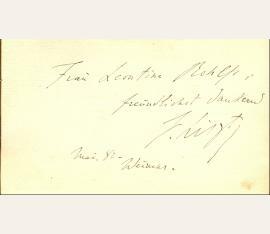 – Nicht bei F. C. Schang, Visiting Cards of Pianists. From the Collection of F. C. Schang with comment by him. New York, Patelson, 1979. – Mit einem kleinen Eckausschnitt. 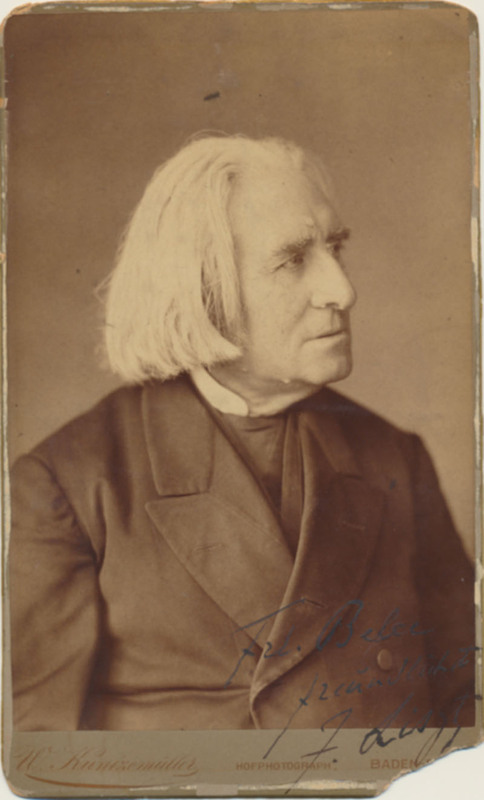 Franz Liszt (1811–1886), Hungarian composer, pianist, and conductor. Autograph letter signed. Budapest, December 15, 1873. 1 p. 8°. 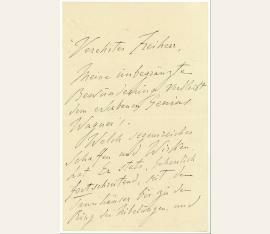 – Refuses an inquiry for a concert in Vienna: „[...] Aufrichtig bedauernd dem Wunsch Ihrer gütigen Zuschrift nicht entsprechen zu können, weil diesmal mein geringes Clavierspiel in Wien, einzig und allein dem Conzert ‚Zum Besten der Kaiser Franz-Josef Stiftung’ angehört [...]“. 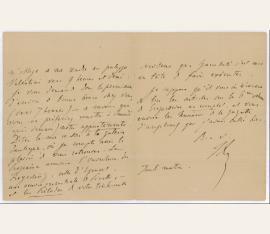 To Rudolf Herfurth, musical director in Lausanne: "I am pleasantly surprised by your kind lines which announce the happy performance and reception of my 'Christus' oratorio under your direction [...]". 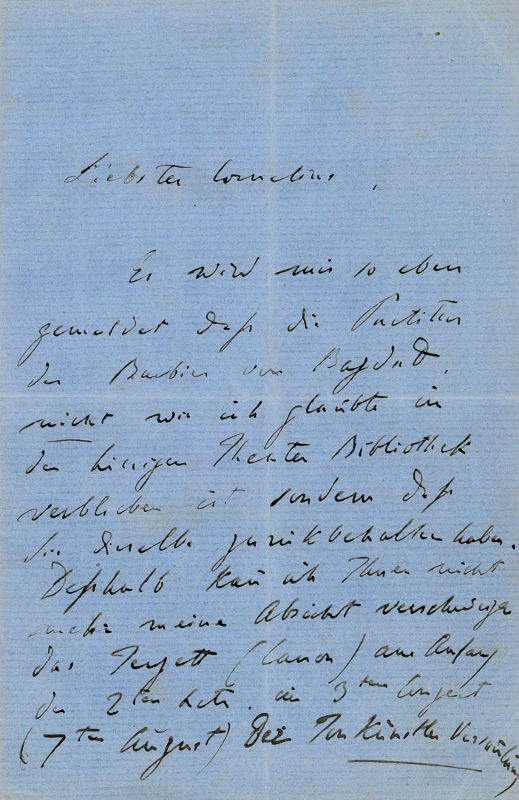 To the German poet Friedrich von Bodenstedt who even resided at the Rohlfs’ mansion, asking him to continue his sojourn there, and inviting him to dine with baroness von Meyendorff and, afterwards, to join his companion at Liszt’s „Hofgärtnerei“, which is nowadays the Liszt House at Weimar. To a Baron: "Amicale invitation pour ce soir. De 8 a 10 heures on fera un peu de Musique commandee, a la 'Hofgärtnerei'. J'espère que Madame de Löen aura d'amabilite d'y venir avec vous [...]". 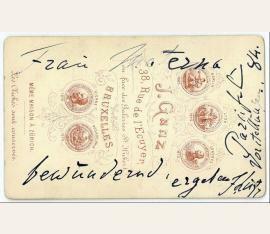 - Printed lettering "F. Liszt" on verso. 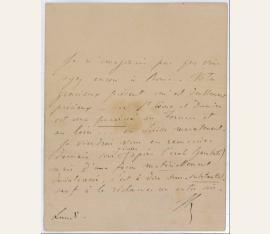 To the Royal Family with the urgent request to support the Goethe Foundation in their plans to celebrate the 100th anniversary of the poet's birthday: "As Her Imperial Highness the Grand Duchess deigned to send me the lines which Your Royal Highness did me the grace of addressing me, I dare to express the very respectful homage of my sincere gratitude to you. The cause of the Goethe Foundation has entirely to do with Weimar's Past and Future, in involving a superbly intelligent and effective protection of the development of Thought and Art, across the vicissitudes of the one generation to the other. 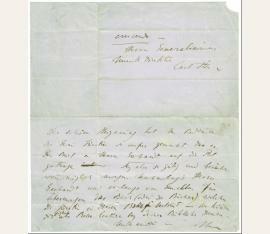 How could I be permitted to doubt the sympathies which the Princess of Prussia had the kindness to show for this cause? How could I believe that Your Royal Highness would deprive it of her powerful support, as it is founded in the name of her glorious memories and her glorious hopes? His Grace the Hereditary Grand Duke felt from the beginning that in this grave and high occurrence it was not a matter of simply granting the citizens of Weimar the right to remember Goethe, but rather to make Weimar, Germany, and consequently Europe participants in the productive luster, in the comprehensive benefits of Goethe's genius. To realize this grand idea, to detach it from the vagueness of words, the morass of equivocalities, and finally to fix it in indelible characters, i.e., in notable, regular, and imposing deeds, His Grace will need all the laborious perseverance, all the indefatigable active courage, resolute and resigned at once, which are the supreme privilege of grand devotions. May I be permitted to hope that at her next visit to Weimar, Your Royal Highness will authorize me to speak more explicitly with her about the Goethe Foundation and the most suitable means of ensuring its active vitality, on which I dare say I have reflected thoroughly; and if then Your Royal Highness deigns not to disapprove of the views of intentions which make up in some way a part of my debt of gratitude toward her august house, my hope to see the tradition of the past powerfully vivified by the work of the present, will change to certainty" (transl.). - Light soiling, internal tear to third page not affecting text. 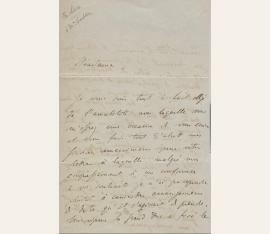 Fine letter to an unnamed Baron, proclaiming his admiration for the work of Richard Wagner: "My boundless admiration persists for Wagner's lofty genius. What fruitful creativity and effect did he achieve, consistently progressing from Tannhäuser to the Ring of the Nibelung and the wonderful Parsifal! - The art of our century finds its edification and its glory in it. 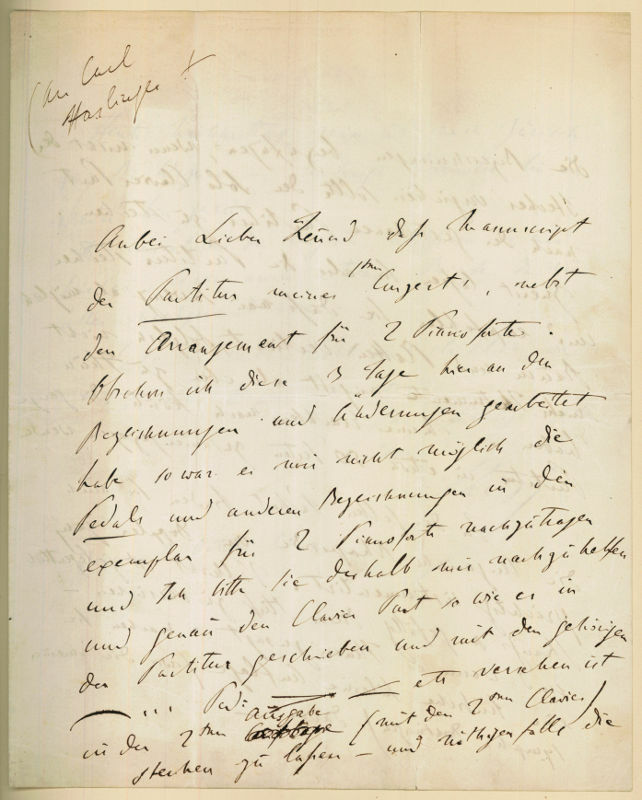 The modest measure of what I wrote about Wagner in letters is at the service of publication [...]" (transl.). 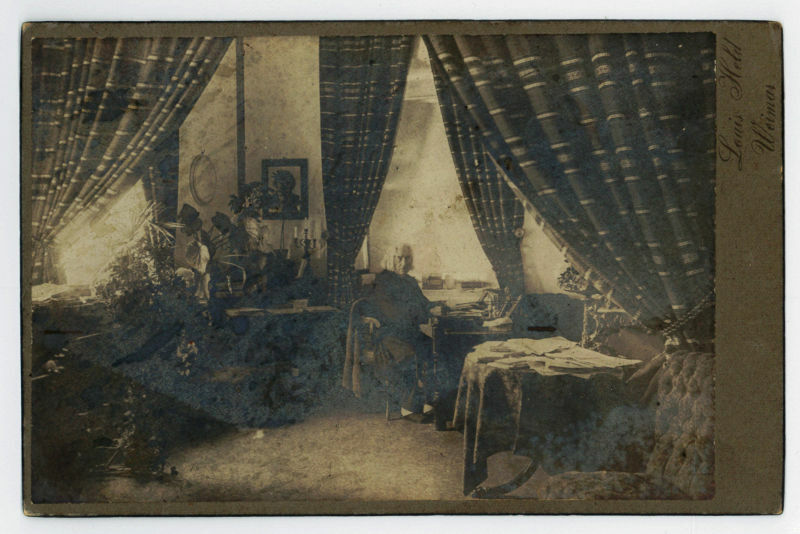 As evidenced by a contemporary remark from Liszt's housekeeper, Pauline Apel, written at the bottom of the cardboard, the portrait (taken by Louis Held) was the composer's final portrait, showing him in the study of his house at Weimar. By this remark, Pauline Apel would approve some prints (such as this) as authentic. 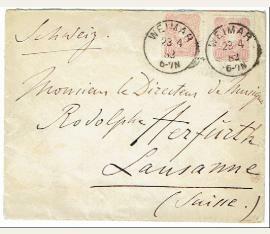 - With embossed signet of Louis Held, Weimar. 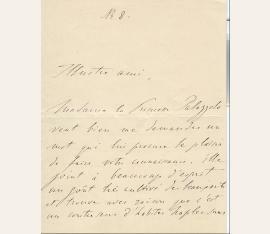 Lettre autographe en français à l'encre noire, signé FL. To an unknown recipient, telling him how hard he had tried to gather some tickets for a concert at the Capitol, and urging him to meet one hour in advance. In French. - Provenance: Robert Bory, musicologist. 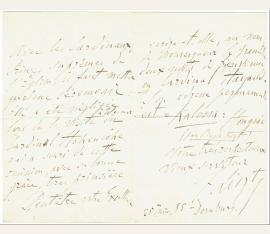 To an unknown recipient, speaking of several concerts like that of "el Congregazione Pontificia Accademia di Santa Cecilia" for which he has a ticket to his correspondent in exchange for a ticket of Alessandro Parisotti held at the Palazzo Valentini, and a concert of his "Preludes" performed by Sgambiati. In French. - Provenance: Robert Bory, musicologist. Franz Liszt (1811–1886), composer. AMusQS. Riga, 8 April 1842. 1 p. Small oblong 8°. With note by another hand on reverse. Folded along the center. 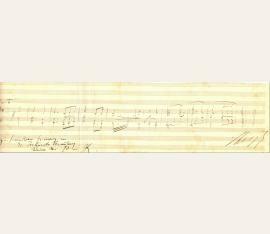 Three bars for piano, on two hand-drawn staves, captioned “Preludio”. 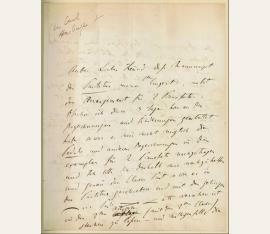 – On March 14, 1842, Liszt had been awarded the honorary doctorate of Königsberg University; he then proceeded to Dresden via St. Petersburg. – The note on the reserve reads: “Perhaps Aunt Paula will be able to solve this riddle of ours? This leaf is by the great master Fr. 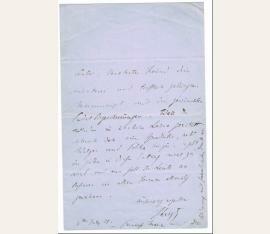 Liszt, who was in Riga in 1842 and who probably handed it to Papa in the salon”. Franz Liszt (1811-1886), Komponist. E. musikalisches Albumblatt m. U., Osnabrück, 12. 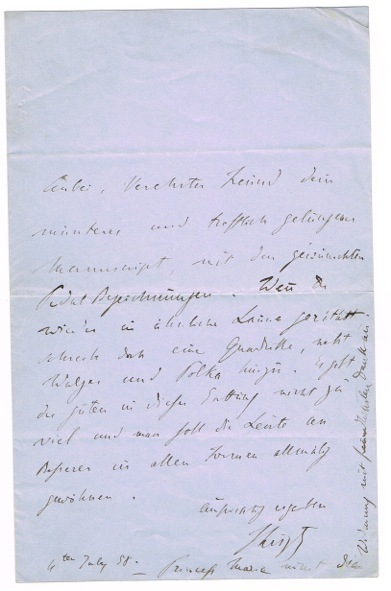 November 1841, eine Seite 4°. Einseitiger Goldschnitt. Drei horizontale Faltspuren. Geringfügige Bräunung durch den Pflanzenzweig. Vier Takte Musik für Klavier in F Dur in 4/4-Takt, auf zwei von Hand gezogenen Musiksystemen. Neben der Unterschrift ist ein Gardenienzweig mit zwei Stichen und Garn befestigt (die gepresste Blüte ist abgefallen). Sehr dekoratives Albumblatt, geschrieben auf einer der zahlreichen Tourneen, die Liszt damals unternahm. Die Jahre 1840-45 waren seine besten Jahre als Virtuose, ganz Europa verfiel damals einer wahren „Lisztomanie“. 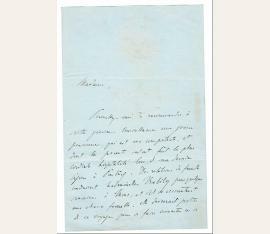 To F. V. Busch, about an appointment: "Tous les regrets sont assurément de mon coté, Madame, et vous êtes cent fois aimable de vouloir bien m'offrir un aussi gracieux dédomagement pour demain soir. Veuillez donc bien agréer tous mes remerciements ainsi que l'expression de mes hommages les plus respectueusement empressés". 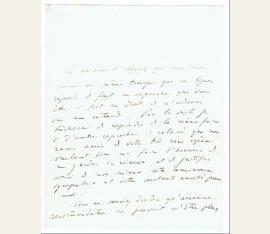 - Letter with small traces of folding and some ink spots; the envelope somewhat dust-soiled. - Provenance: Skottorp Castle. 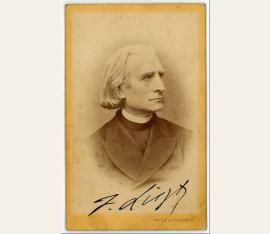 Franz Liszt (1811–1886), componser and pianist. A.L.S. with A.Mus.Q. in the text. Tivoli, “Villa d’Este”, 30 July 1874, 1¾ pp. large 8vo. With crowned initials in red. Slightly browned and smudged; torn creases restored. To a Viennese composer who had dedicated his opus 6 to him: “[…] Your 5 fantasies offer many elegant and successful elements: among them their ingratiating cadence: [four bars of musical quotation here]. 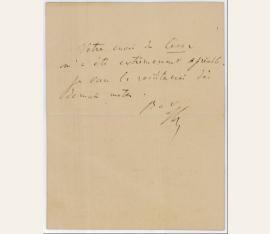 I should like to quote you more, on the piano: we will probably have the opportunity in Vienna […]”. 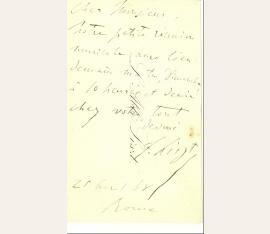 Lettre autographe signée au ténor Karl Beck ( ?). Probably to German tenorist Karl Beck, on his performance of „Tannhäuser“ and on his piano variations of Berlioz’ „Benvenuto Cellini“. 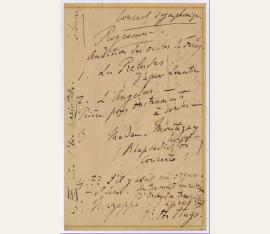 Being very proud of his work on „Benvenuto Cellini“ (“I think I have done a masterpiece!“), Liszt has written 14 piano transcriptions of Wagner's operas in total. Eigenh. Brief m. U. „FLiszt“. 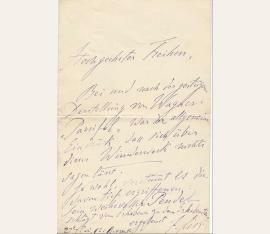 To the singer Agnes Schöler (not identified in the text): "I would be happy if you were to participate in the Sonderhäuser Tonkünstler Versammlung. Please contact Professor Riedel [...]". 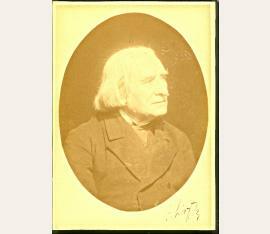 Small black-and-white portrait of an older Liszt, on thin paper, formerly mounted, some paper still adhering to the verso, with the signature in black ink. Eigenhändiges musikalisches Albumblatt, signiert „F.Liszt“. Franz Liszt (1811–1886), Komponist. E. Briefentwurf. O. O. u. D. ¾ S. 4°. – An Cajetan Frh. von Felder (so am oberen Blattrand von fremder Hand in Blaustift notiert): „Verbindlichst dankend für Ihr verehrliches Schreiben, und gewärtig der Datum’s Bestimmung über die General Probe und Aufführung des benan[n]ten Concertes, von Seiten des Comite’s, beehrt sich wiederholt Demselben bereitwilligst folgsame Mitwirkung zu versichern. Euer Hochwohlgeboren, Locha [?! ]“ – Cajetan Frh. von Felder (1814-1894) war 1868 zum Wiener Bürgermeister gewählt worden, reorganisierte Verwaltung und Finanzwesen, modernisierte die Wasserwirtschaft der Stadt und initiierte die Errichtung zahlreicher repräsentativer Gebäude (darunter auch die Rotunde). Wissenschaftliches Ansehen erwarb sich Felder (der seit 1860 Mitglied der Deutschen Akademie der Naturforscher Leopoldina war) als Entomologe und Besitzer einer bedeutenden Schmetterlings- und Käfersammlung. – Beiliegend eine alte Antiquariatsbeschreibung des Blattes. – An den Rändern stärker lappig, mit kl. Einr. und größeren Läsuren. 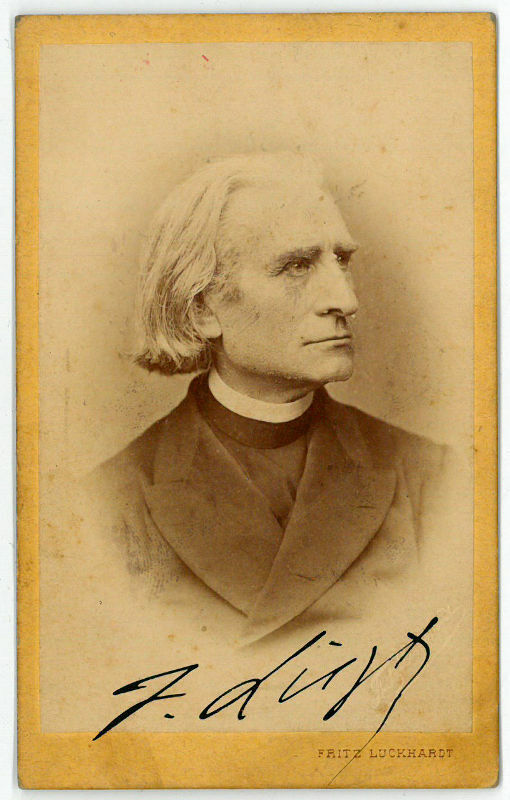 Franz Liszt (1811–1886), Austrian composer. Cabinet photograph signed. N. p., [c. 1882]. 166 x 111 mm. – Fine portrait of the aged composer in three-quarter profile by Louis Held, Weimar. Franz Liszt (1811–1886), Komponist. Photographisch reproduziertes Stahlstichportrait. O. O. u. D. 149:101 mm auf etwas größerem Untersatzkarton mit gedr. Firmennamen des Ateliers Louis Held, Weimar. – Verso mit e. Beschriftung von Liszts Haushälterin Pauline Apel: „Fr. Liszt | Die Altenbruger Zeit | Weimar Liszt Haus | Pauline Apel | 30jährige Dienerin | von Liszt“. Franz Liszt (1811–1886), Komponist. Photographisch reproduzierte Lithographie. O. O. u. D. 149:101 mm auf etwas größerem Untersatzkarton mit gedr. Firmennamen des Ateliers Louis Held, Weimar. – Verso mit e. Beschriftung von Liszts Haushälterin Pauline Apel: „Fr. Liszt | in Paris | 26 Jahr[e] | Pauline Apel | 30jährige Dienerin | von Liszt“. For the Austrian soprano Amalie (Friedrich-)Materna (1844-1918), chamber singer in the Vienna Court Opera and the first Viennese "Brünhilde" in "Walküre" (1877) and "Siegfried" (1878): "Frau Materna / bewundernd ergeben / F. Liszt / Parzifal Vorstelllungen 84". - With the envelope. 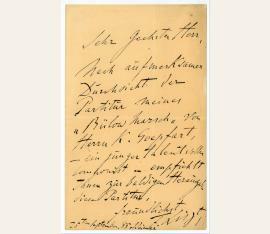 To an unidentified recipient, thanking for having introduced him to several ladies from Erfurt who had provided help at a Goethe festival, and regretting having missed a Miss Schwerter. 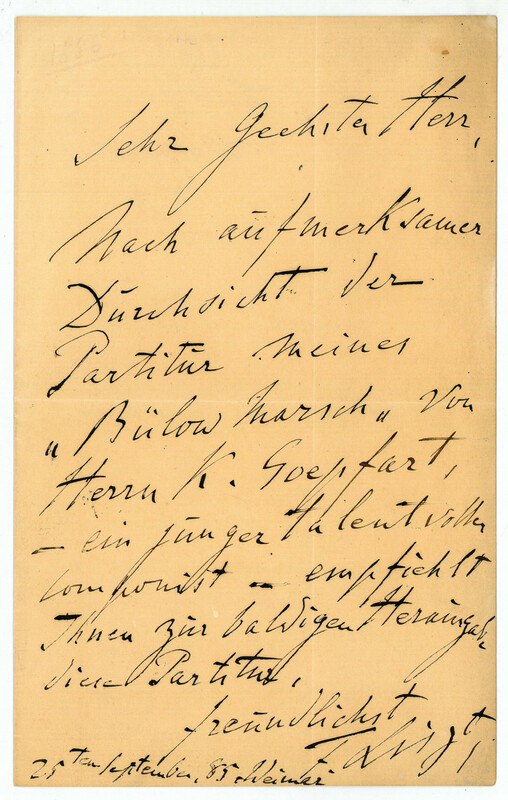 To an addressee in Vienna (possibly Ignaz Bösendorfer? 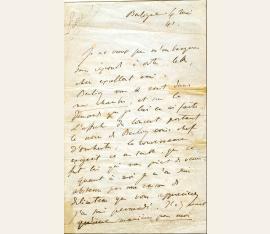 ): "[...] Demandez à [Karl Georg] Likl auquel vous ferez bien mes amitiés, de prier de ma part le meilleur facteur de physharmonicas, de vouloir bien me prêter pendant 5 ou 6 mois un physharmonica qui devra m'être adressé le plus tôt qu'il le pourra chez Mr. Lefebre, 40 Cäcilien Strasse à Cologne. Je ne sais si je pourrai garder cet instrument mais en tout cas je voudrais l'avoir ce printemps à Cologne pour des raisons que je vous dirai plus tard. S'il était possible que le même facteur fabrique pour moi un instrument à deux claviers dont l'un Physharmonica, l'autre Pianoforte, et que moyennant je ne sais quel mécanisme on peut faire aller au besoin les deux claviers ensemble, cela m'enchanterait. Peut-être même pourrait-on poser les deux claviers sur une pédale de deux octaves - ce qui compléterait l'instrument. - Il va sans dire qu'il faut que le Piano soit excellent et le Physharmonica idem. Je désire aussi que le tout se fabrique sans qu'on dise que c'est pour moi et que Likl et vous me gardiez le plus absolu secret. Si la chose reuissit" (breaking off). Franz Liszt (1811-1886), Musiker; Komponist. 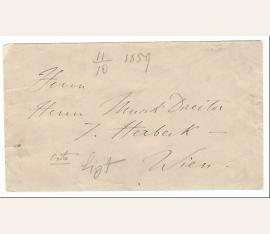 Gedruckte Visitkarte m. e. Zusatz verso, [Berlin] o. D. [um 1860]. 1 Seite quer-16°. Bleistift. Knickfalte, etwas unfrisch. An einen Herrn wegen eines Treffens. „Es wäre sehr freundlich von Ihnen Verehrter Herr, wenn Sie mir wissen liessen zu welcher Stunde ich Sie treffen könnte oder vielleicht meine Tochter im Laufe des Nachmittags besuchten.“ Unter dem gestochenen Namenszug die Adreßangabe: „Anhalt Straße | 11 – | bei Bülows“. – Seine Tochter Cosima hatte am 18. 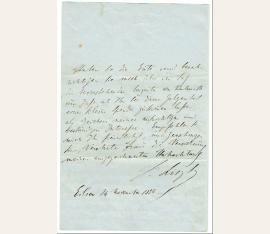 August 1857 Hans von Bülow geheiratet. 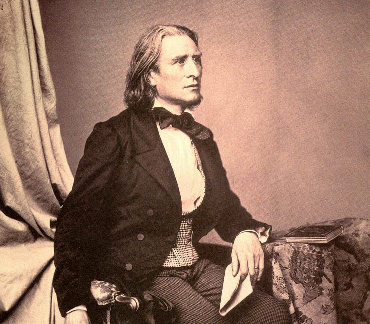 Franz Liszt (1811–1886), Komponist. 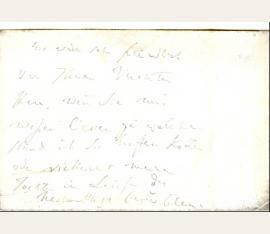 E. Musikmansukript [Fragment], o. O. u. D., 1 Seite quer-schmal-4° (29 x 4,3 cm). 3-zeilig. Knapp beschnitten. 2 Fehlende Eckchen; Faltspuren; Mittelfalz gebrochen. 12 Takte einer Komposition für Klavier. Auf der Rückseite mit einer Echtheitsbestätigung seiner Haushälterin Pauline Apel „Pauline Apel bescheinigt das die Noten von Liszt selbst sind, Weimar. Liszt Museum“.